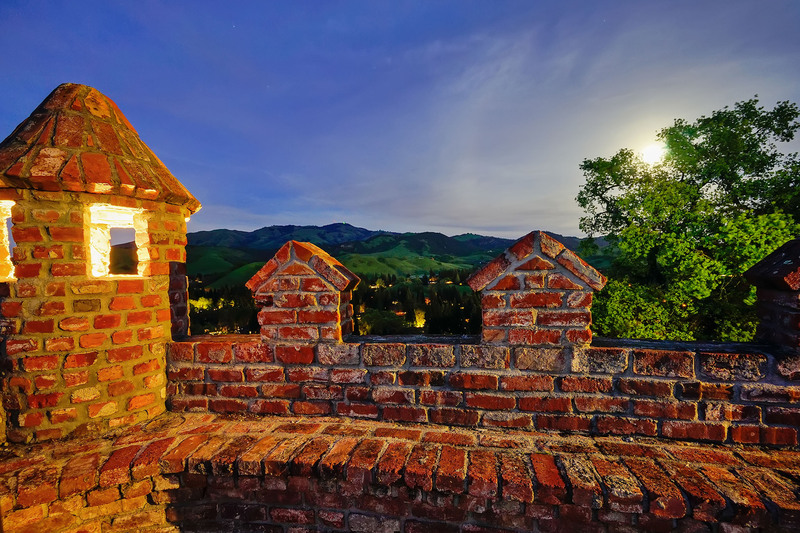 Breathtaking views are just the beginning of what you will experience when visiting what is known as The Castle of Alamo. 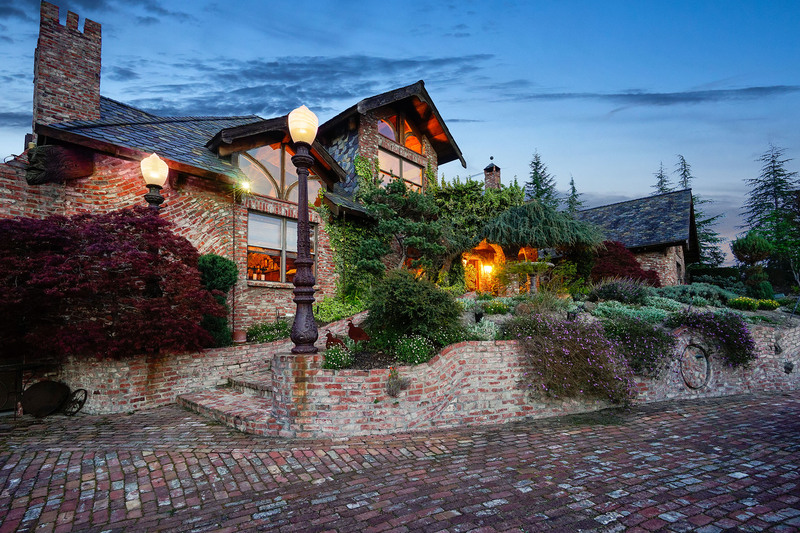 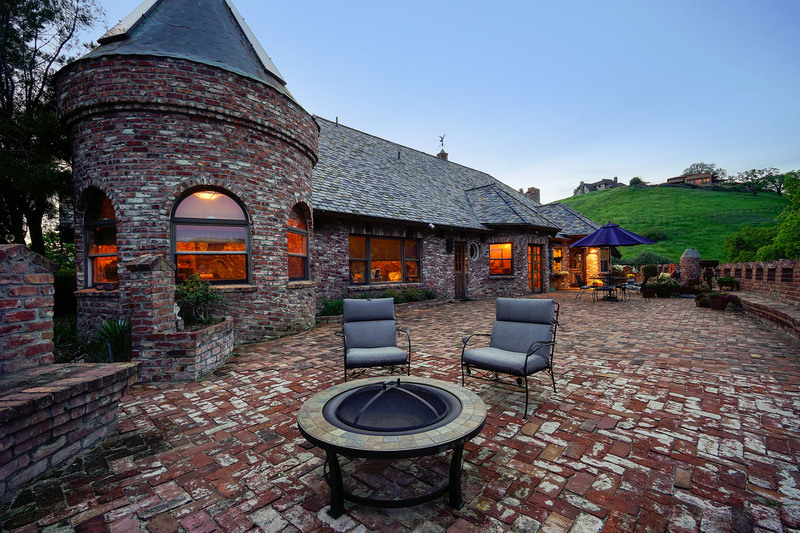 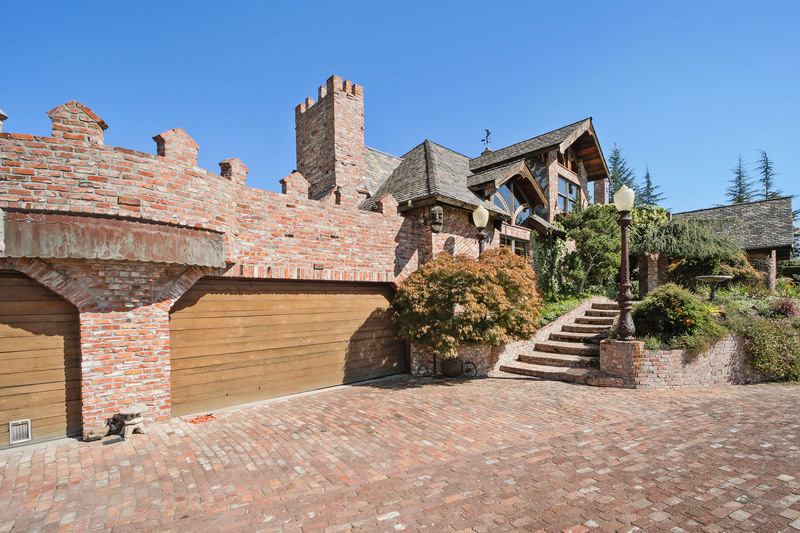 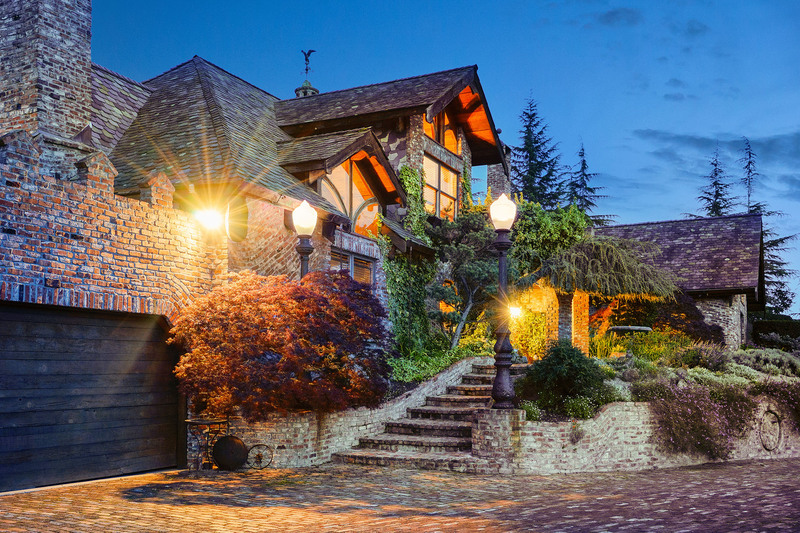 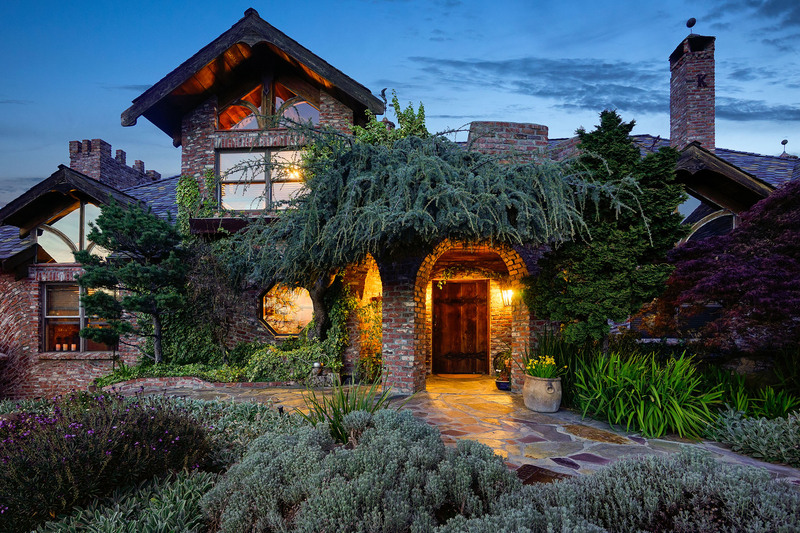 Privacy, serenity and open space add to the character of this majestic estate. 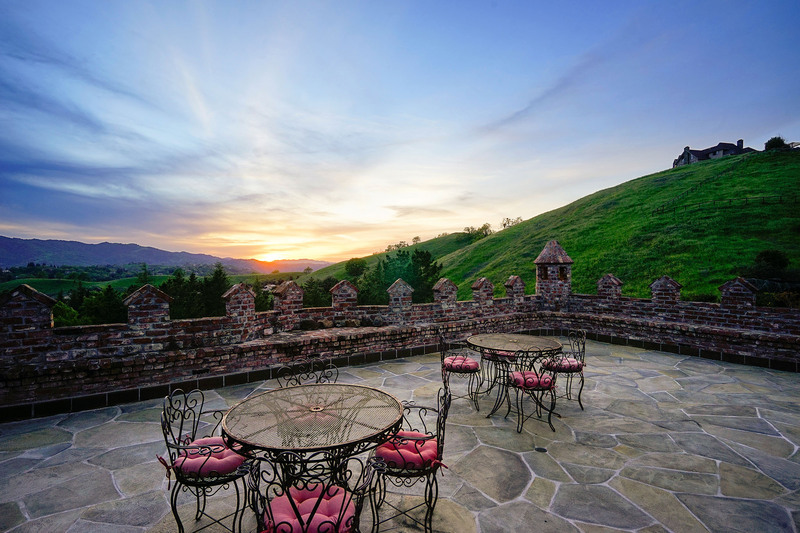 Marvel at the stunning sunrise and sunset vistas. 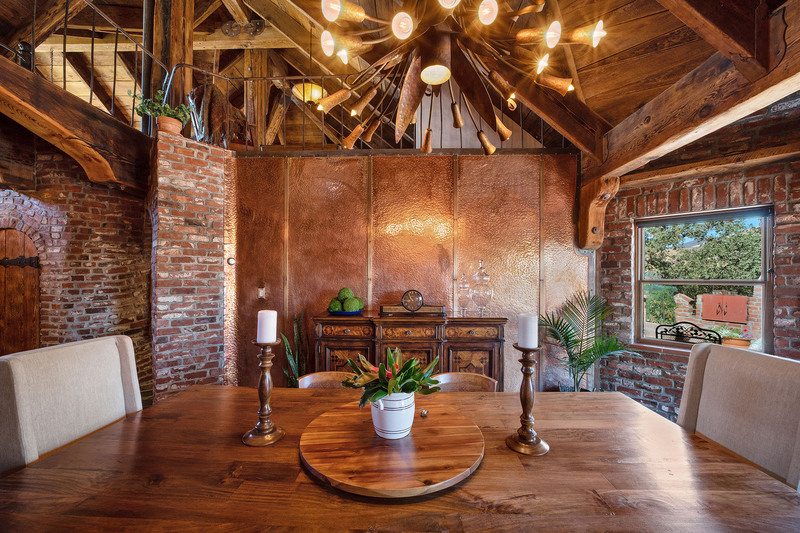 Many of the materials used to build the home were recycled from various places around the region, making it truly one of a kind. 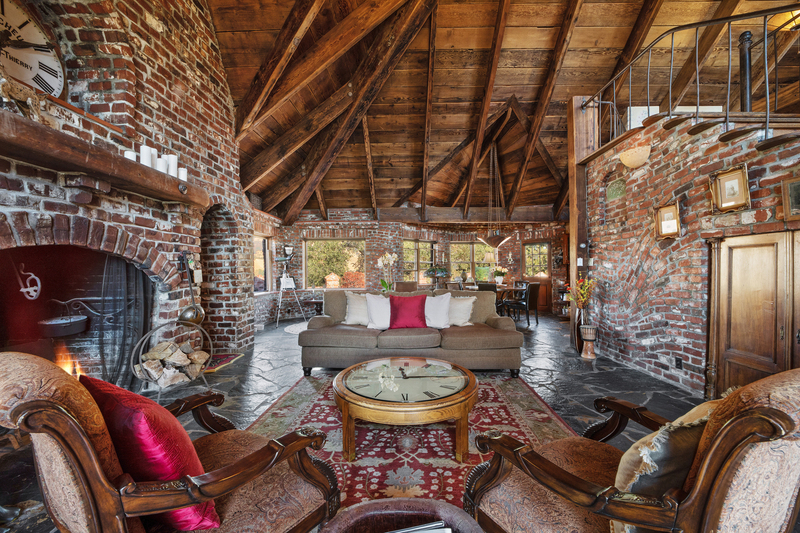 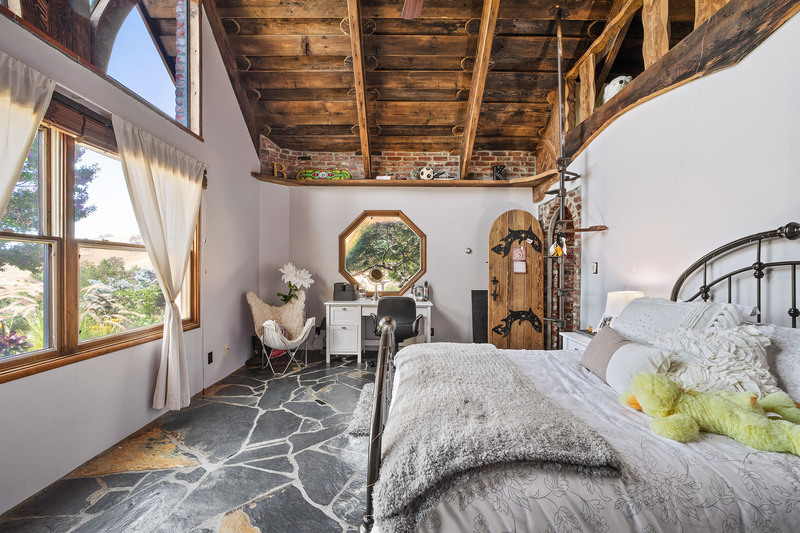 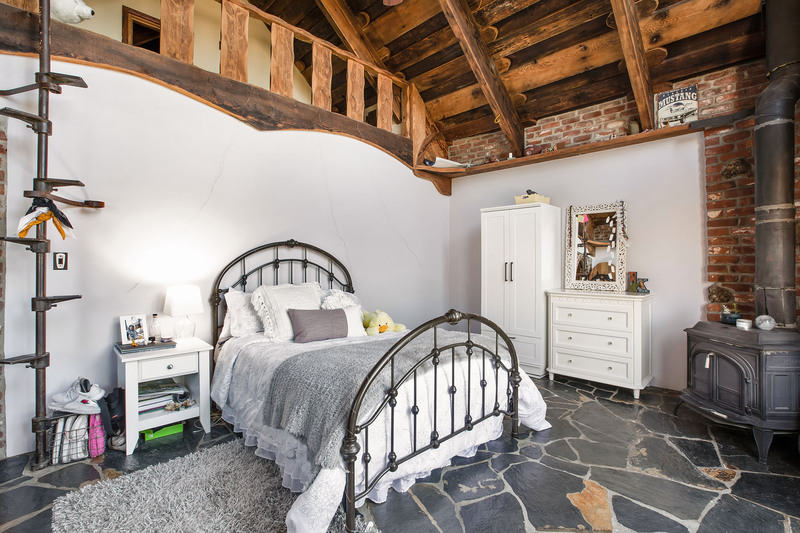 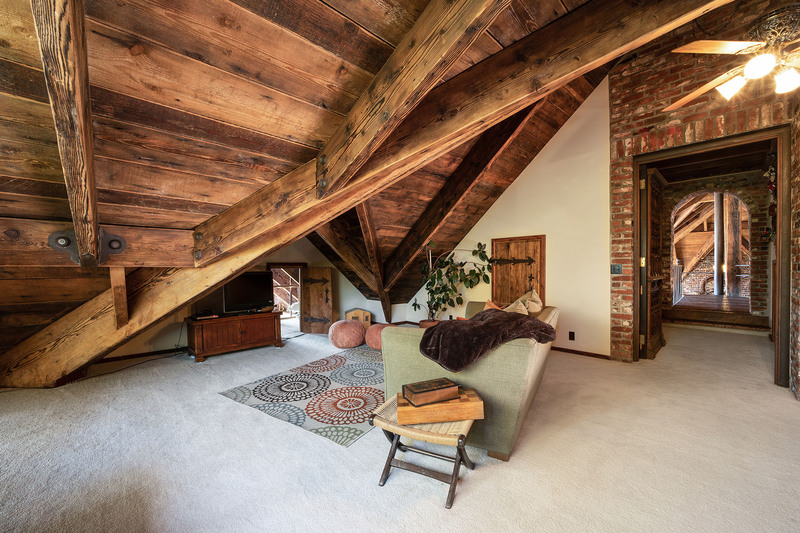 The home was constructed in 1988 with over 120,000 used bricks many of which were found, and nearly forgotten, in an old warehouse in downtown Oakland. 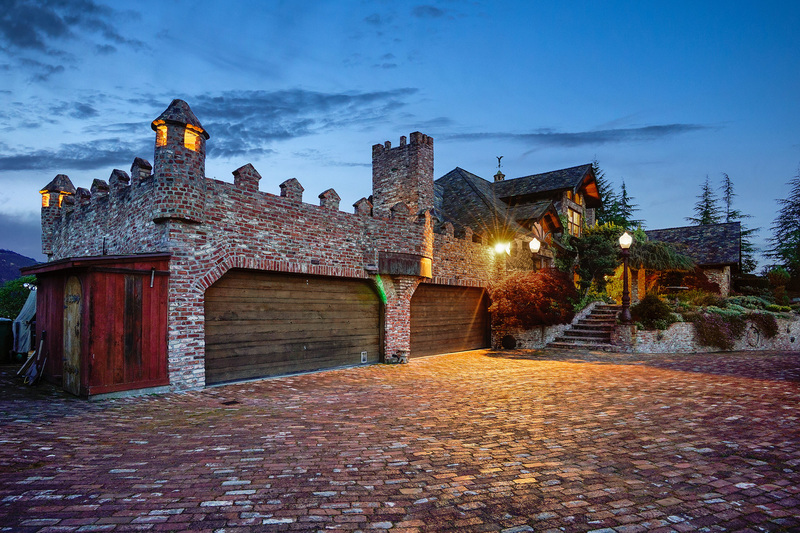 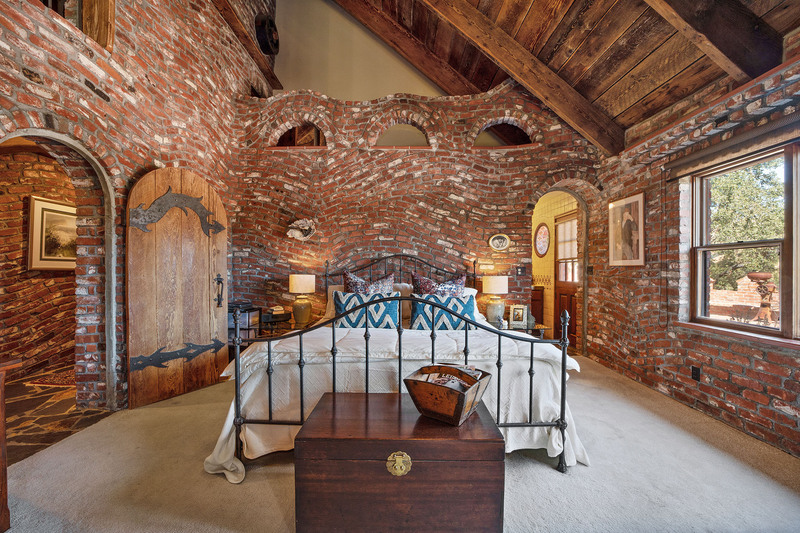 All of the doors in the home were custom made for their particular spot due to the creative brickwork throughout the home. 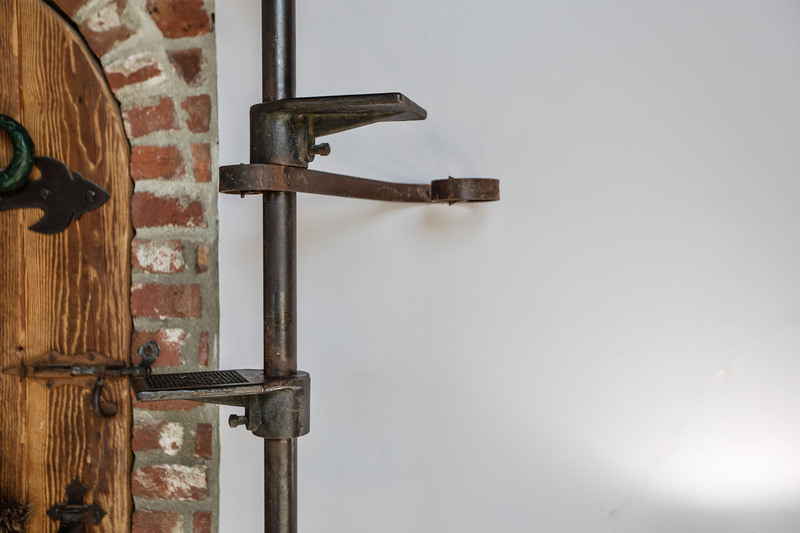 All of the door hinges and handles were individually fabricated on site from steel plate. 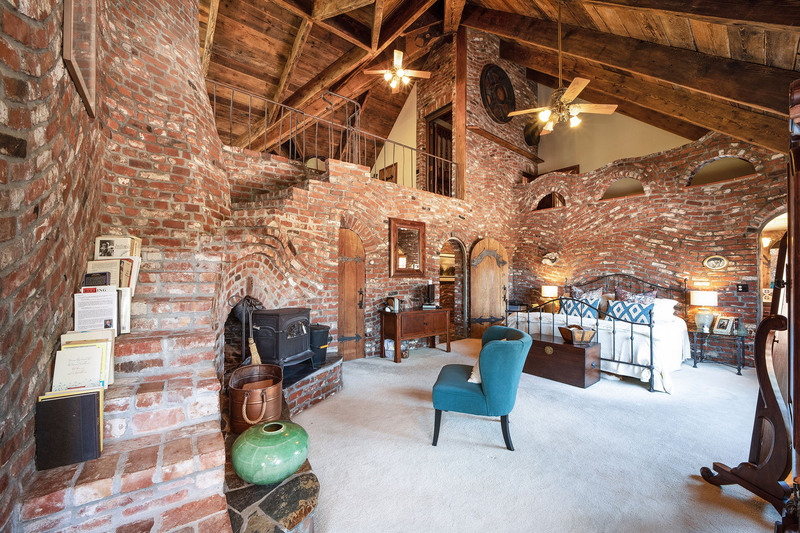 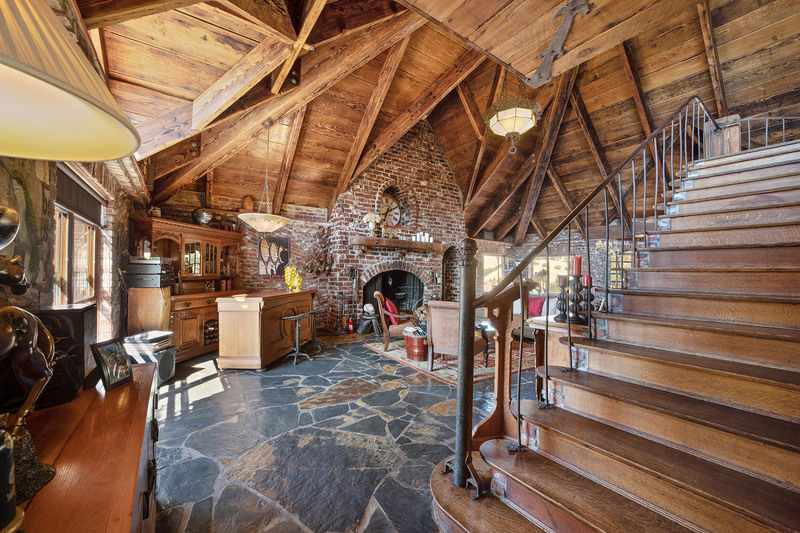 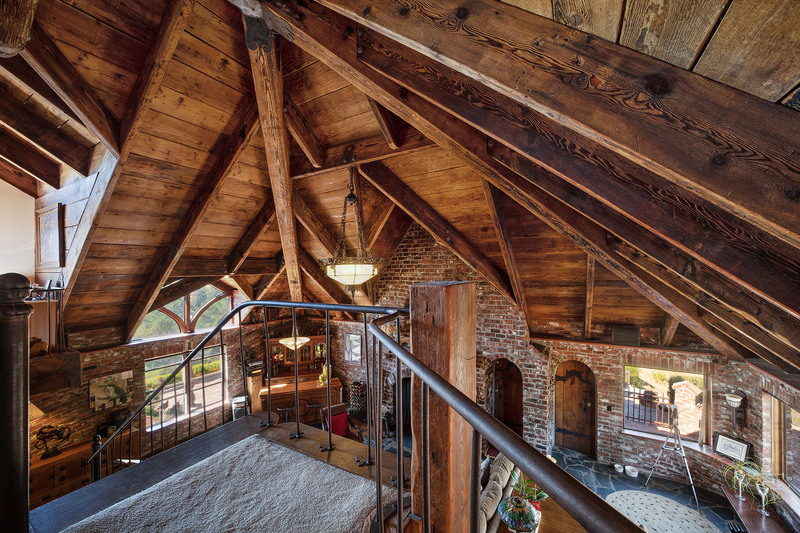 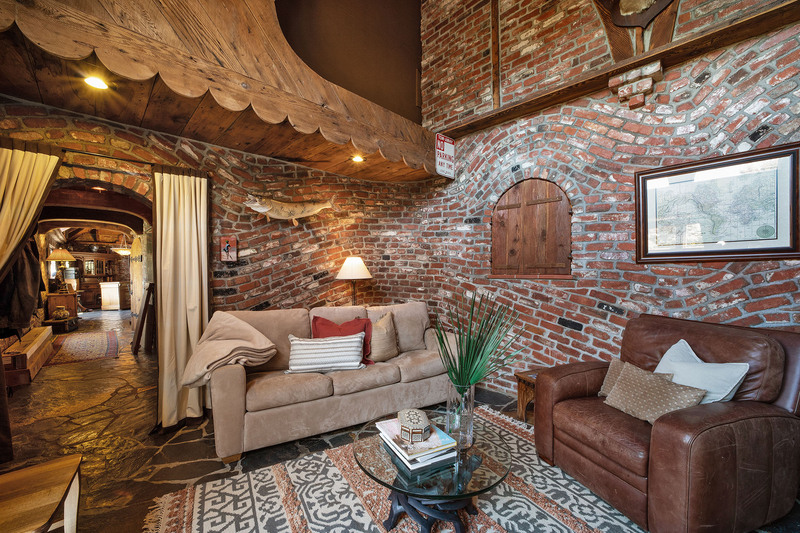 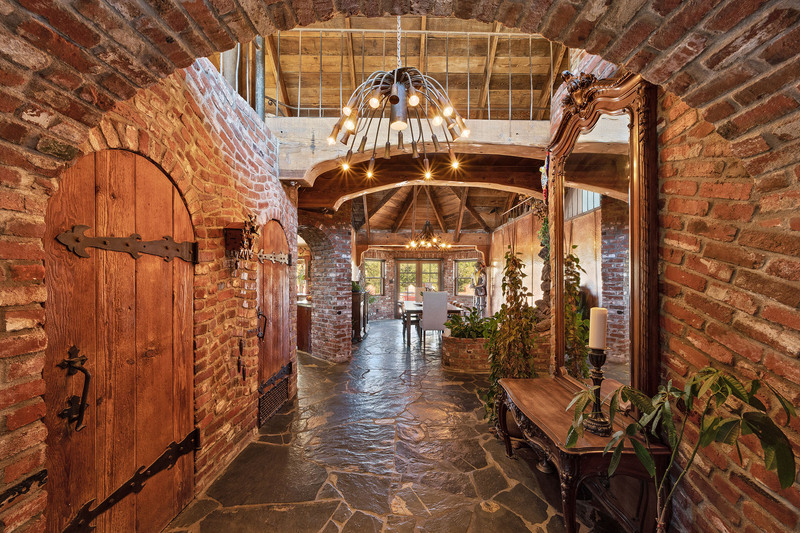 Distinctive features at every turn include the crafted brick walls, an invisible waterfall feature, and a staircase made of salvaged church pews. 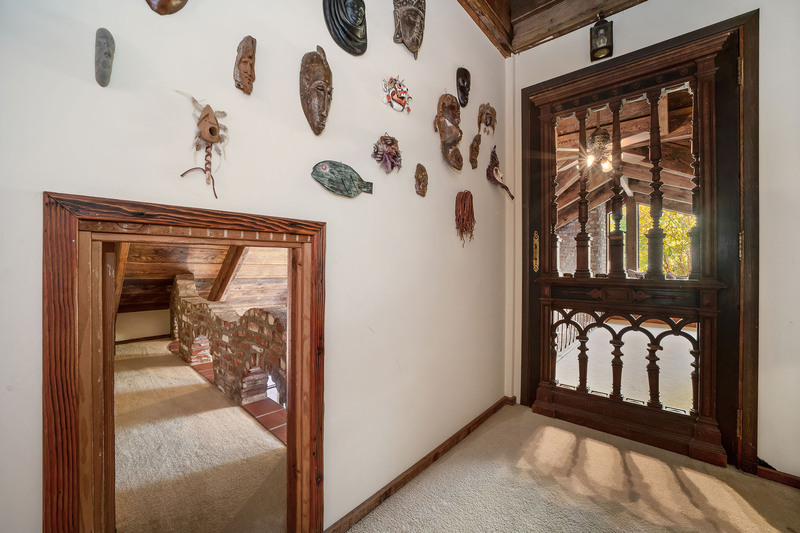 Unique roof rafters protruding from under the eaves outside were individually hand-carved into interesting faces, animals and objects. 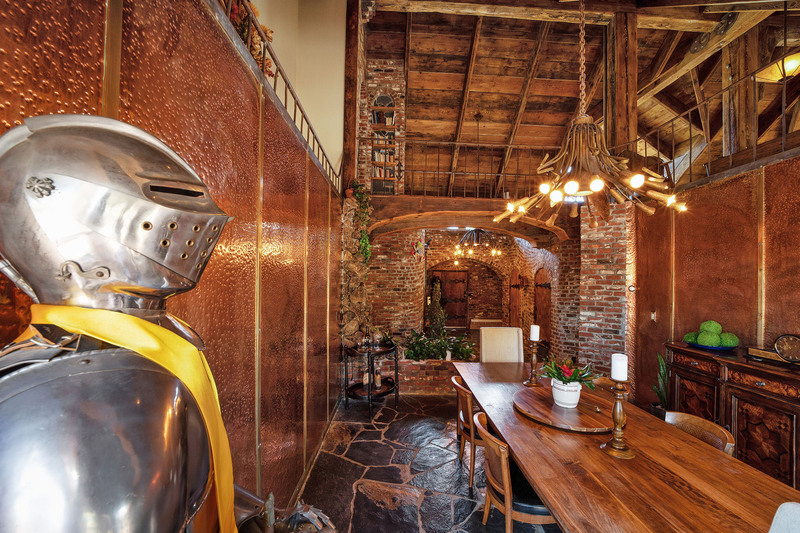 Enjoy touches of whimsy around every corner... it’s like living in your own piece of art! 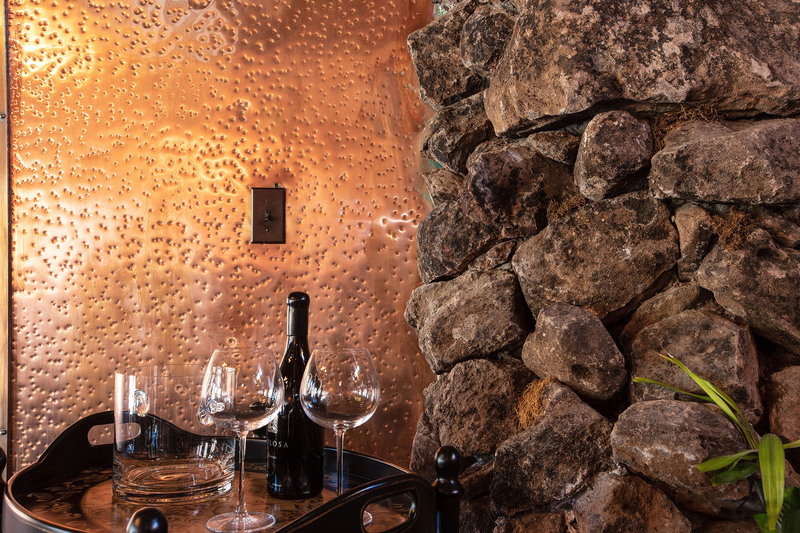 Fascinating “invisible waterfall” where water cascades down from the second level and falls through rocks behind the visible surface rocks. 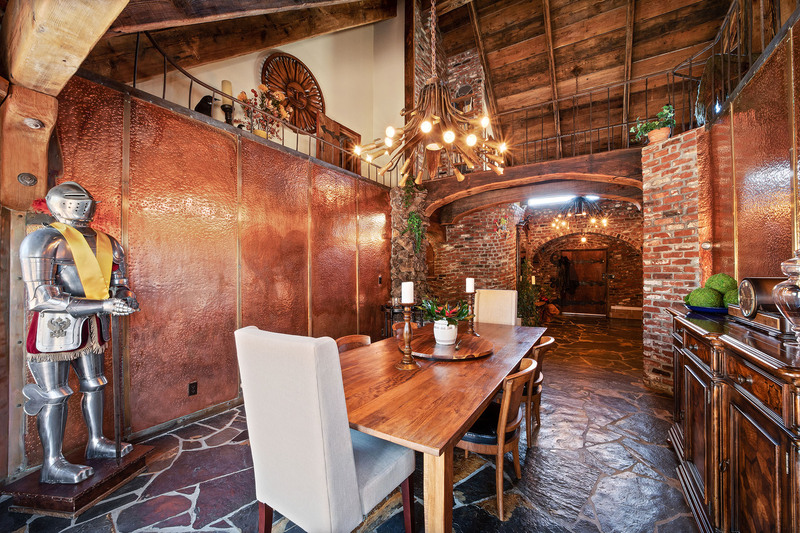 Hand hammered copper wall coverings, custom copper chandelier and French doors leading to patio with stunning views of Mt. 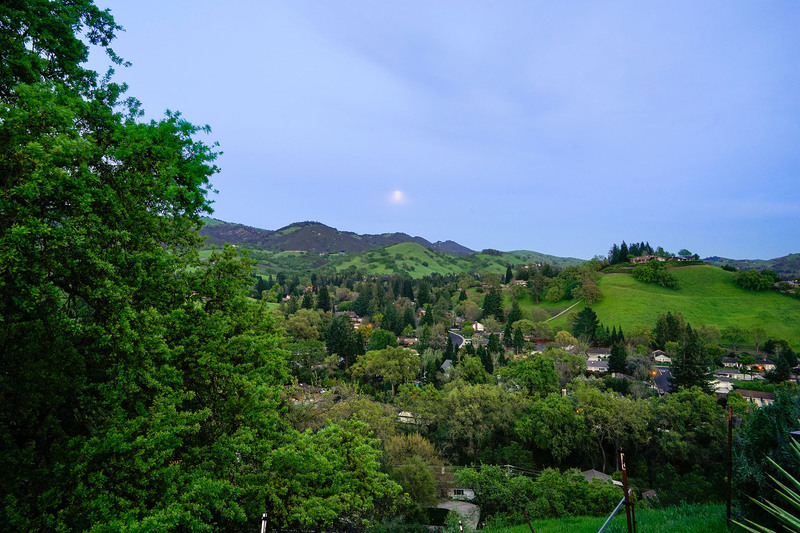 Diablo and surrounding valley. 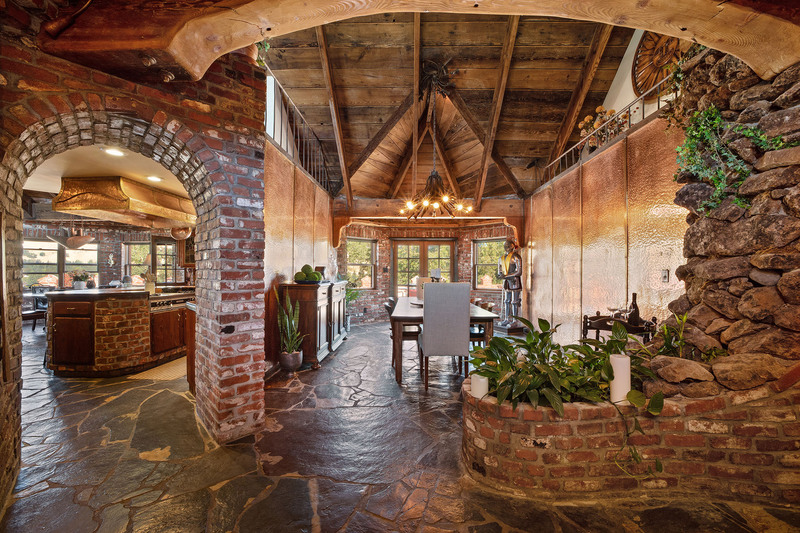 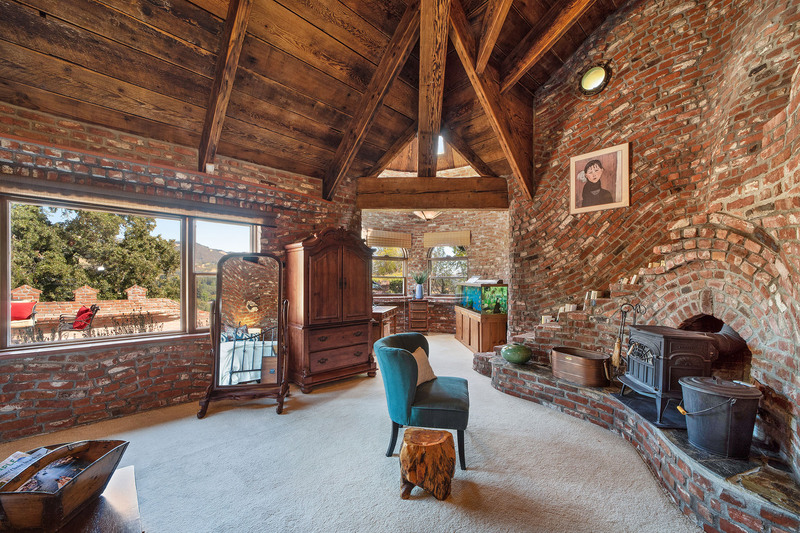 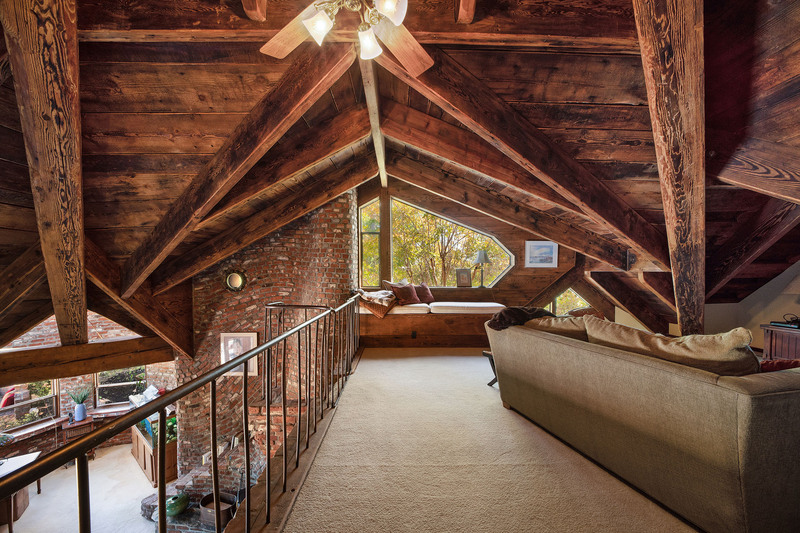 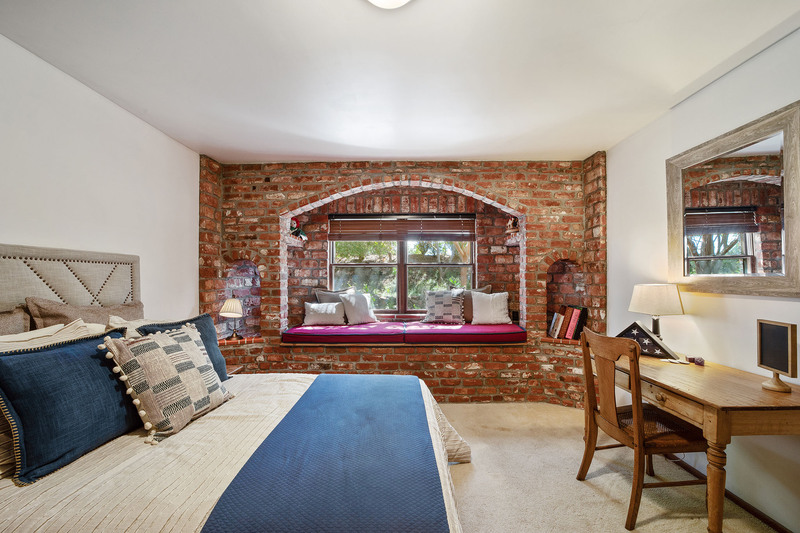 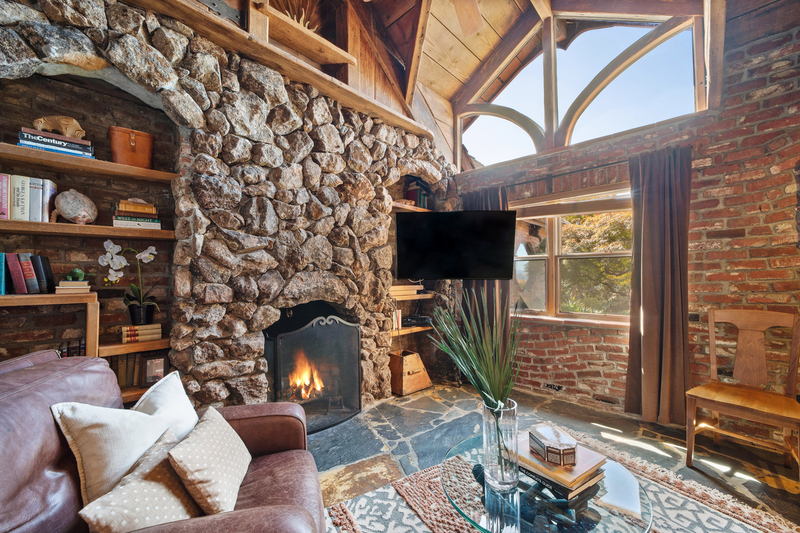 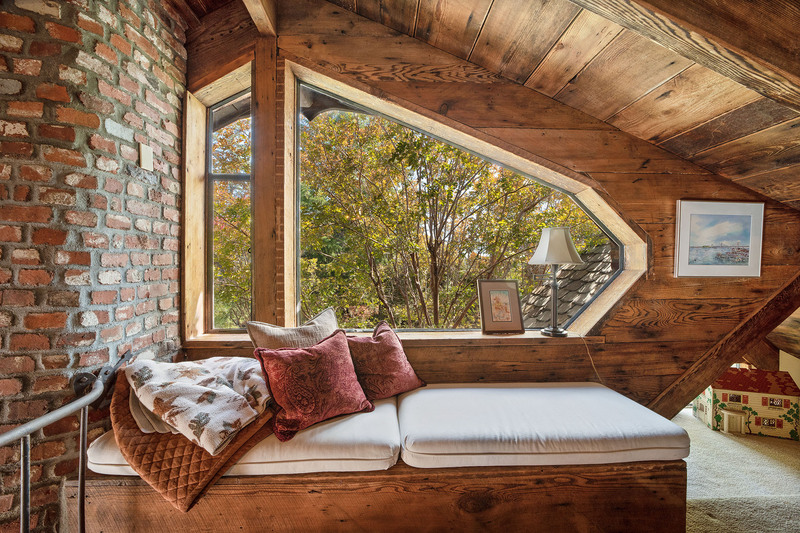 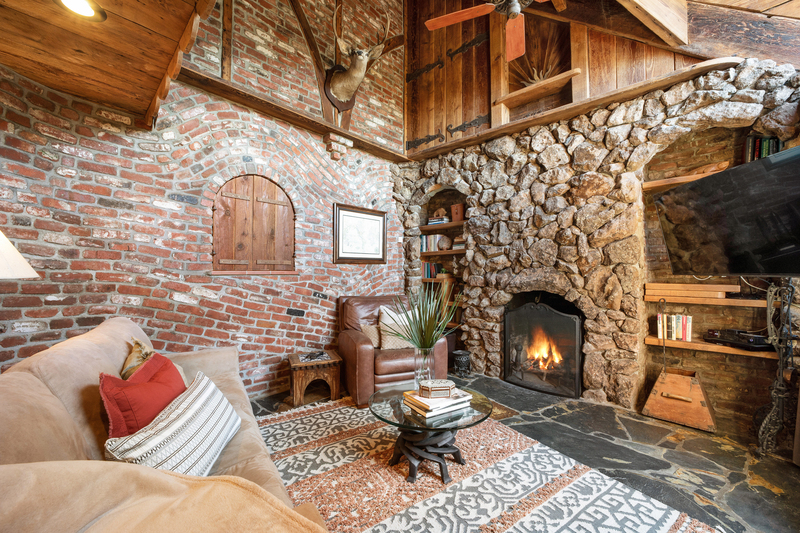 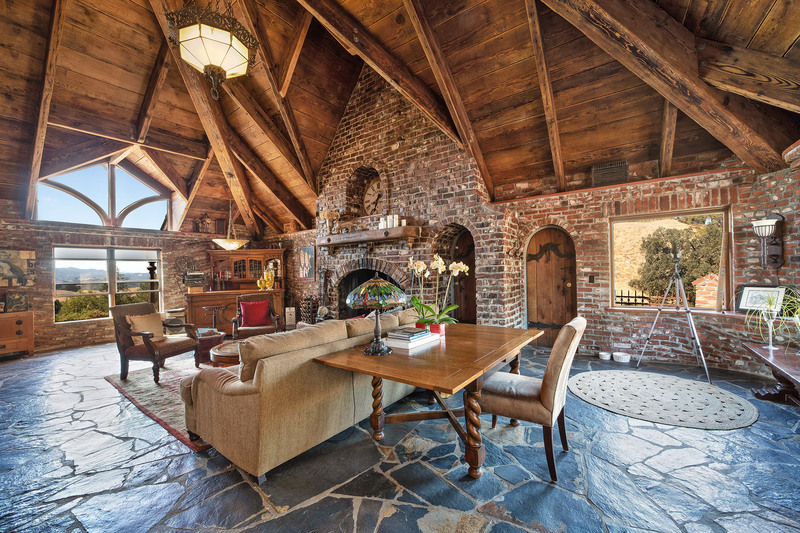 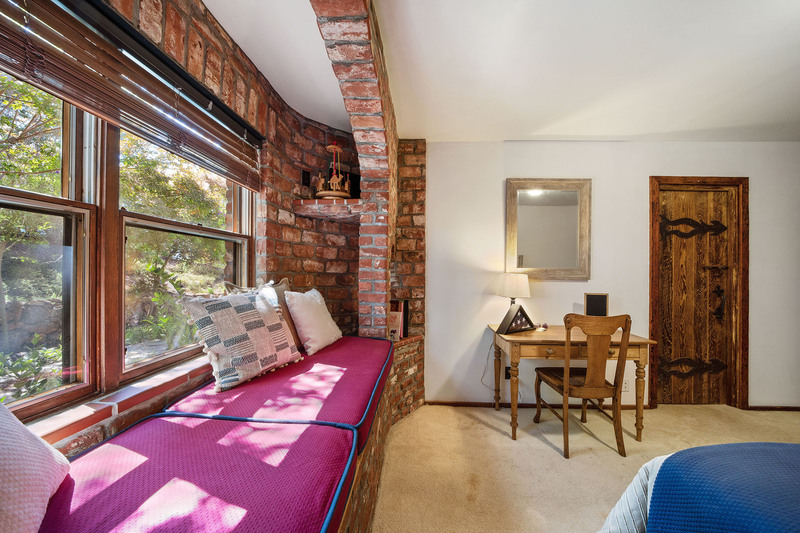 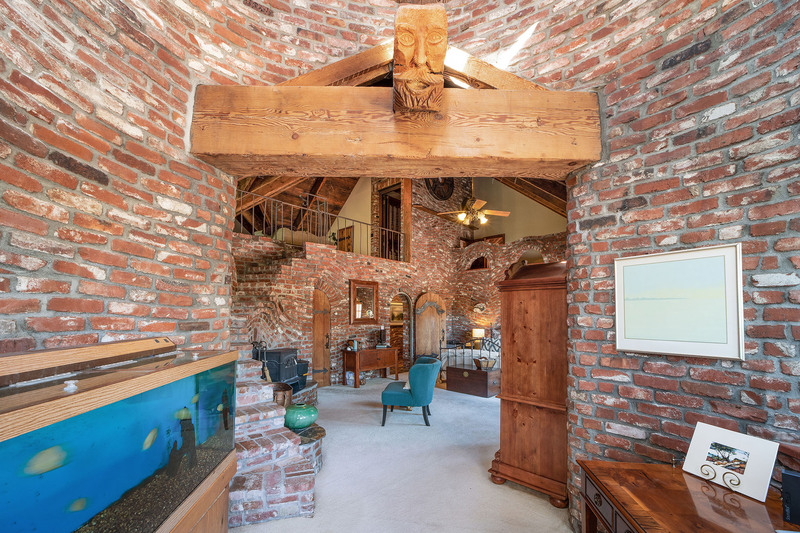 Features a wood-burning fireplace and “Jonesy” window designed by a bricklayer named Carr Jones, the originator of the “wavy and sculptural” effect done in the brick hence named “Jonesy”. 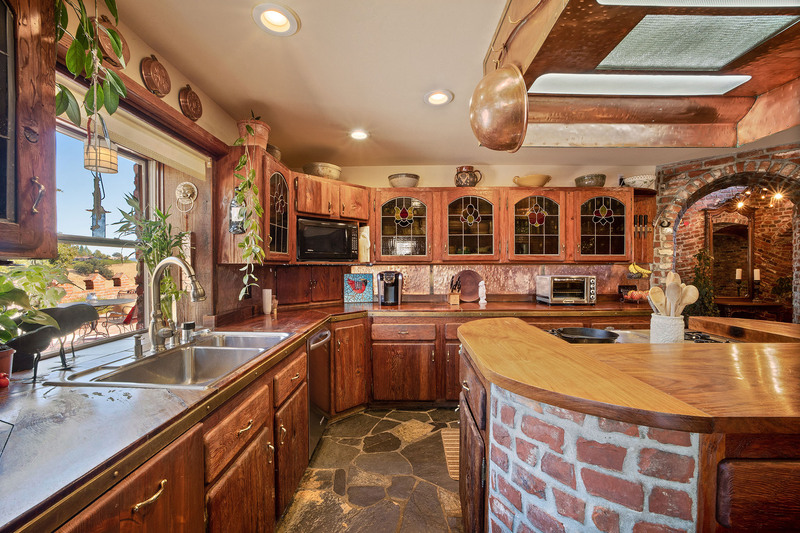 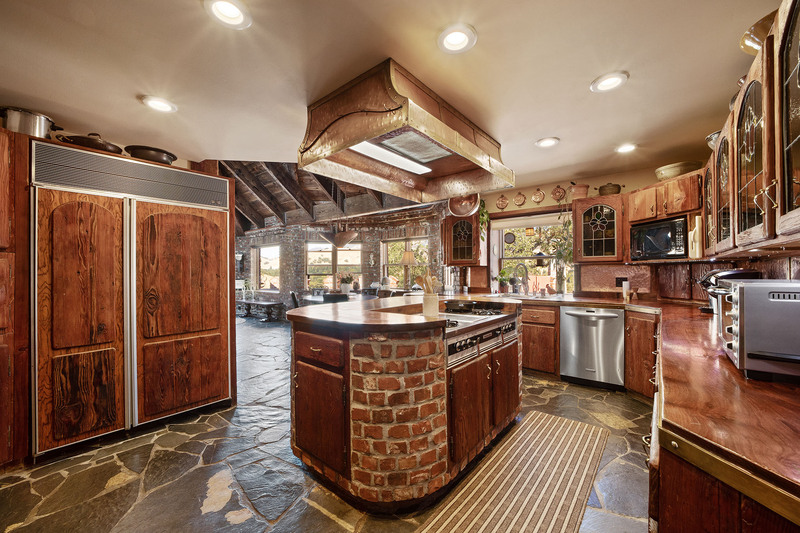 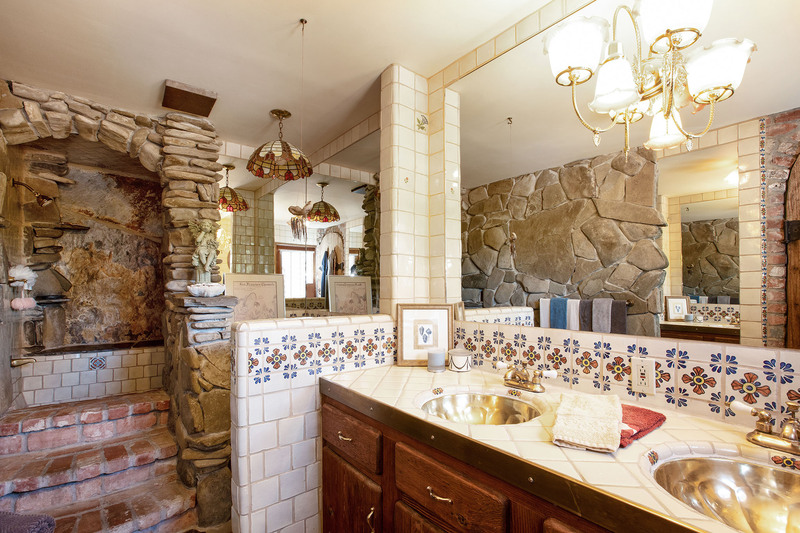 Expansive use of river rock on the counters and most surfaces. 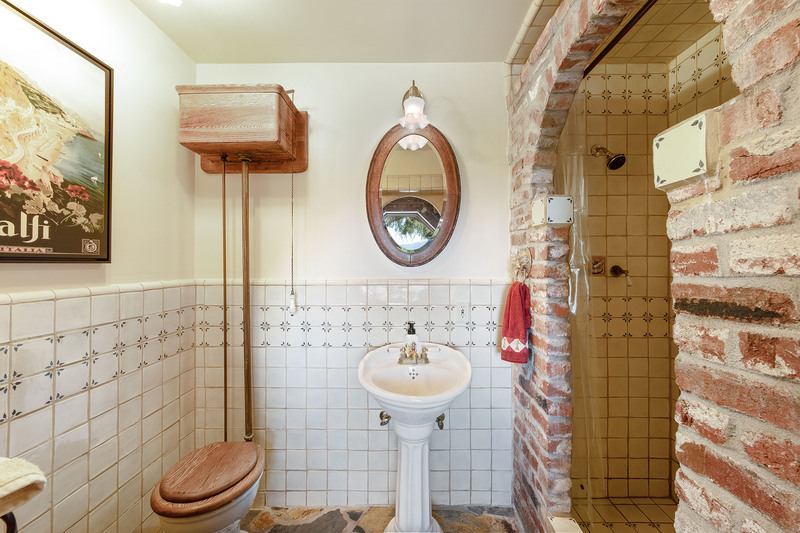 Vanity cabinets are made of barn wood and the light fixture was sourced from an old bar in Jack London Square. 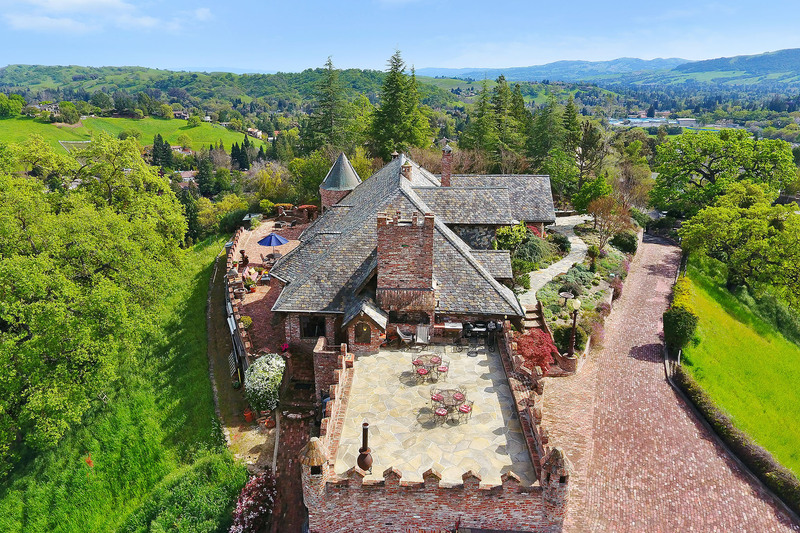 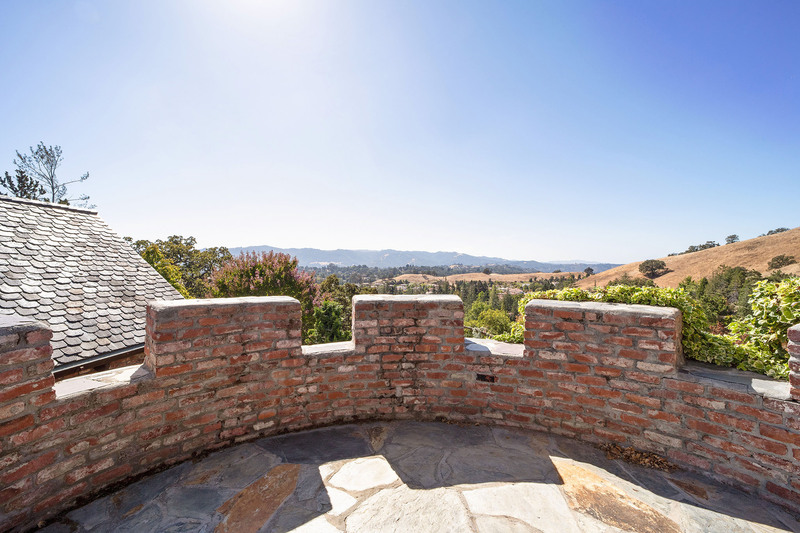 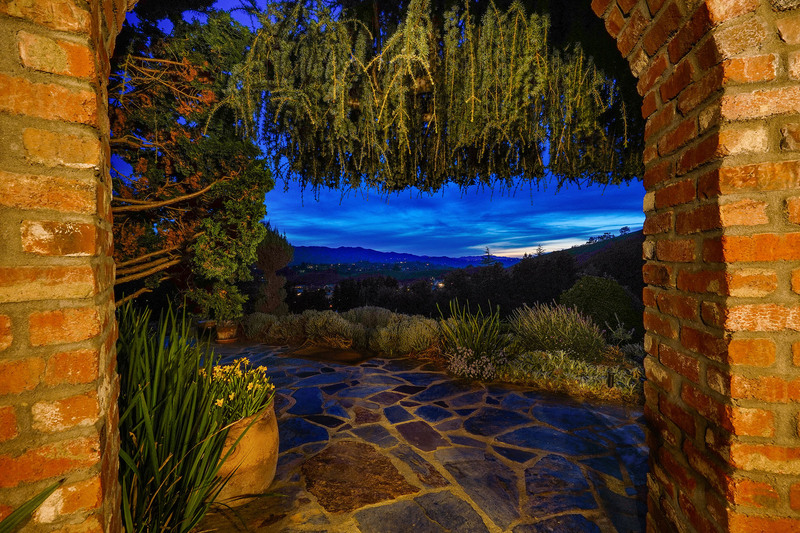 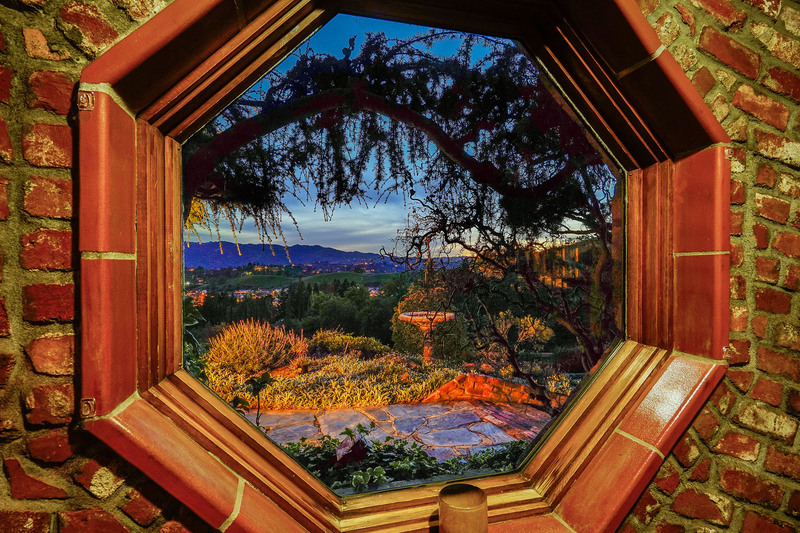 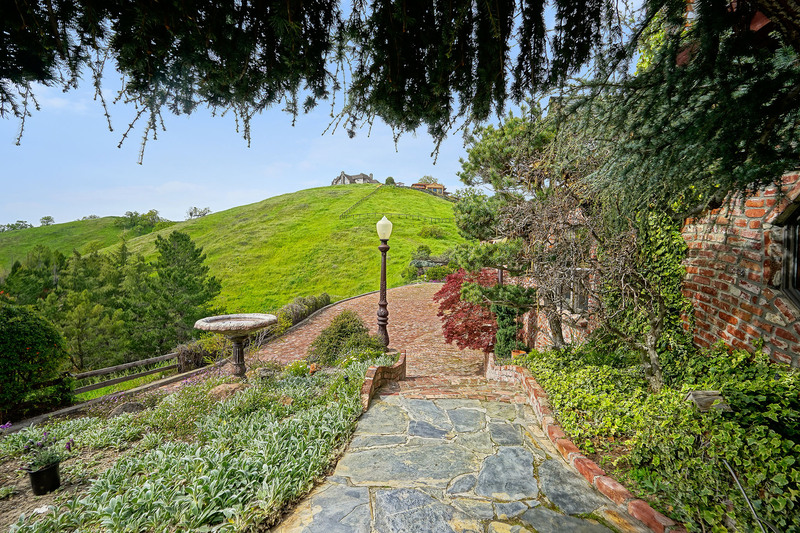 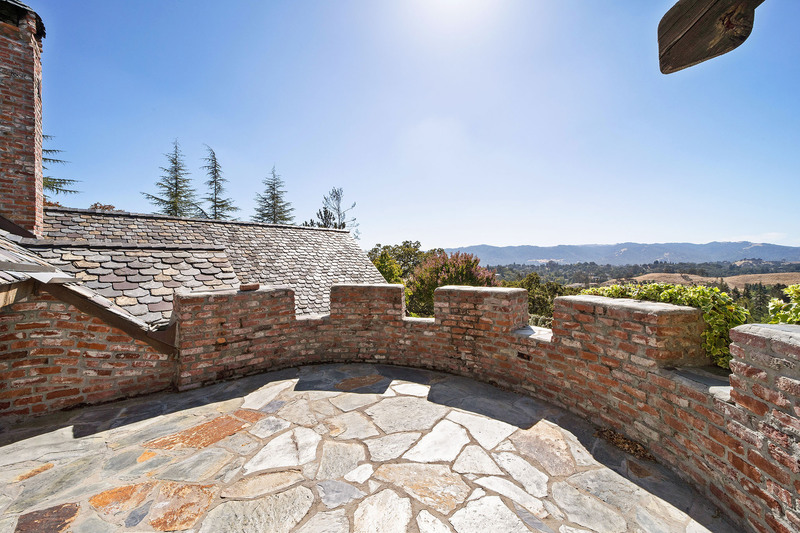 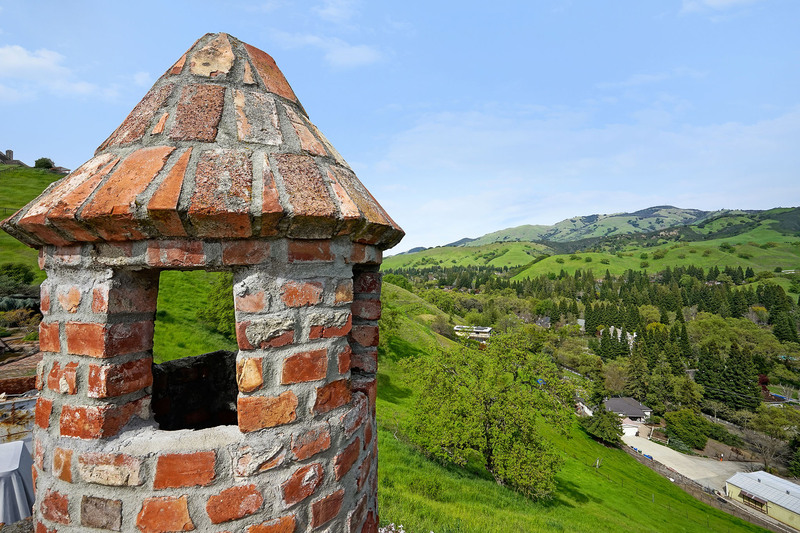 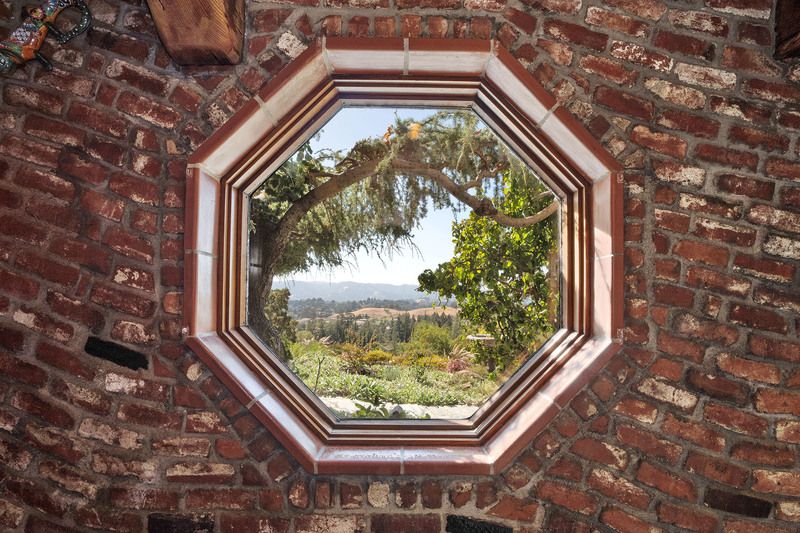 Contains a “Jonesy” window and dramatic view of the Las Trampas ridgeline and surrounding valley. 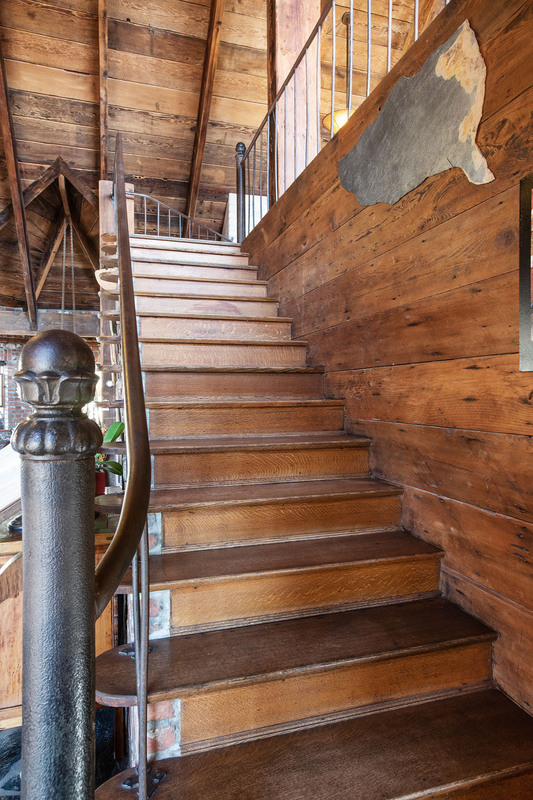 An old “press ladder” from the pressroom at the Oakland Tribune serves as a stairway/ladder to the cozy loft area. 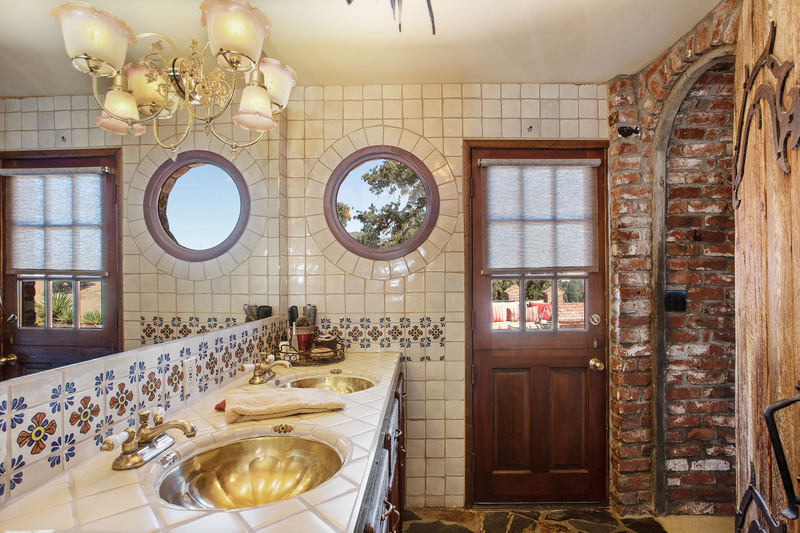 Contains several unusual decorative pieces including old molds used for railroad train wheels and a true porthole from a ship. 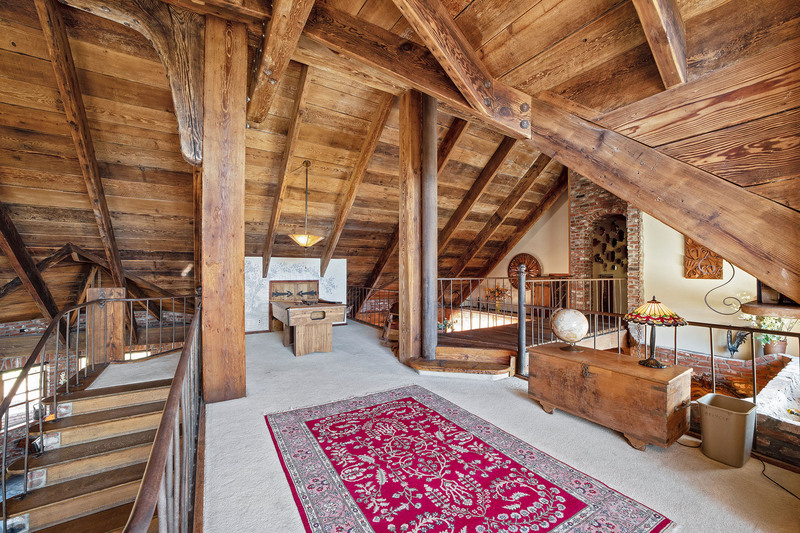 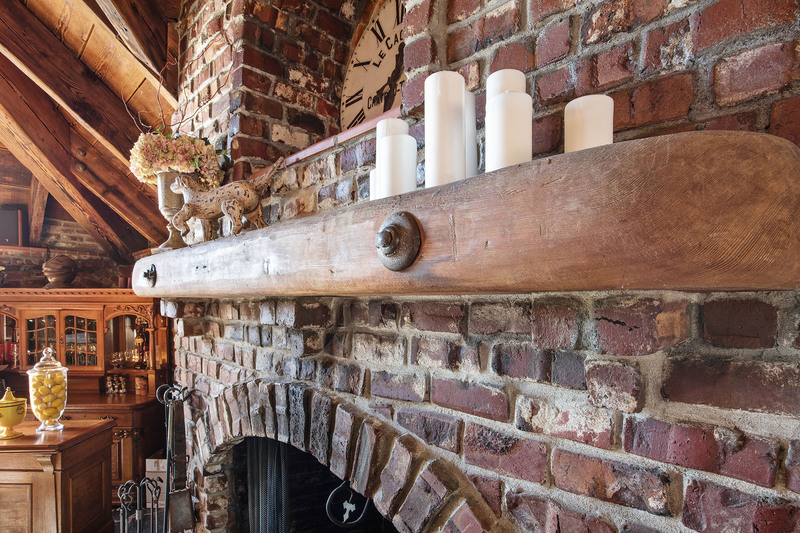 The chimney tilts back before going upwards and has a series of step-like shelves on it leading to the loft above. 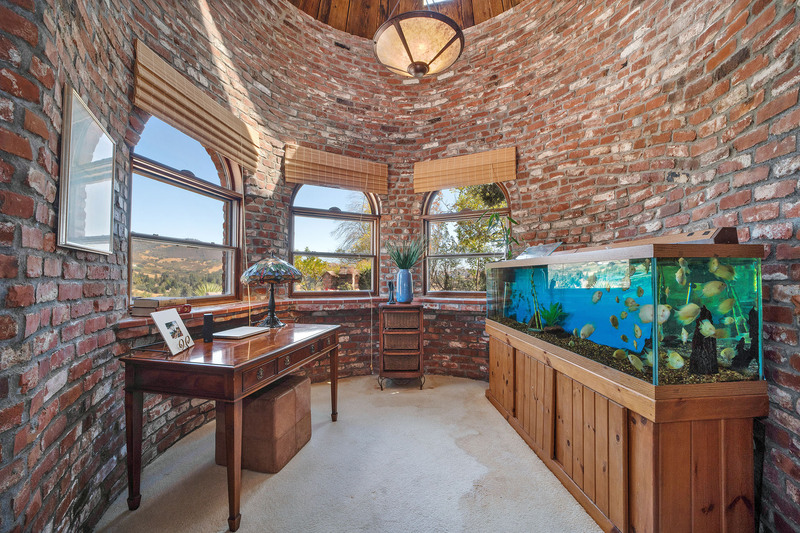 A circular turreted area of the bedroom is perfect for reading or writing. 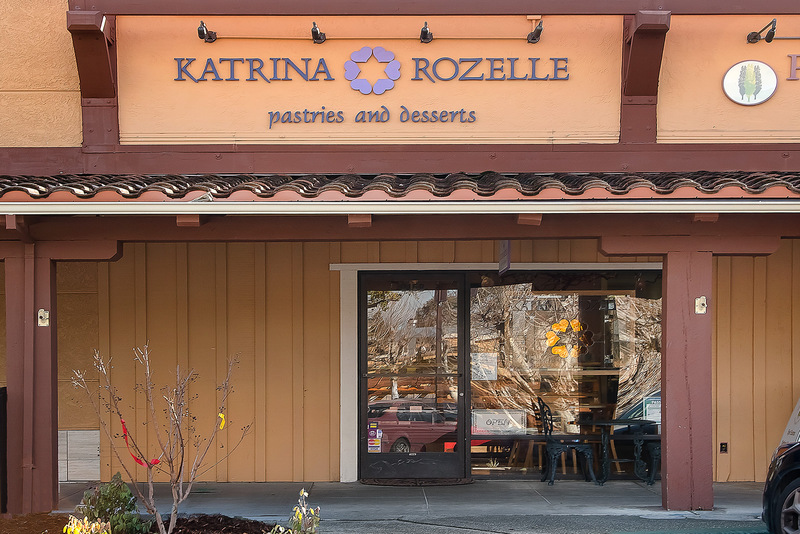 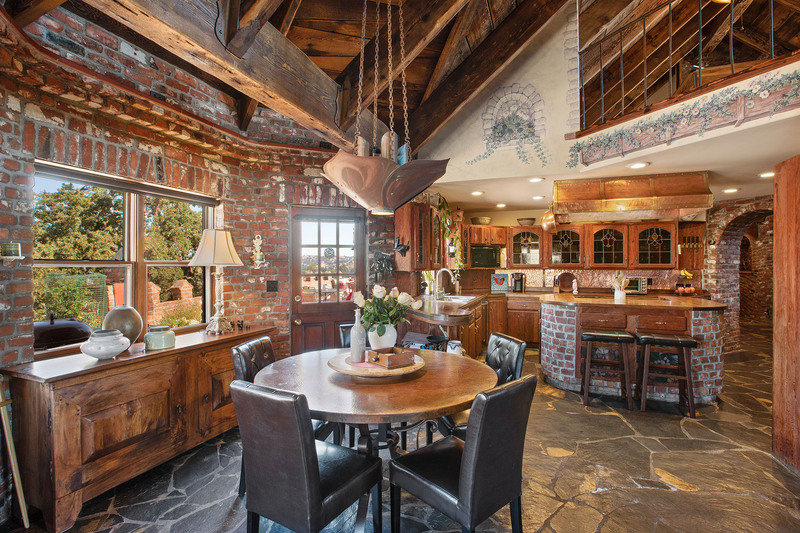 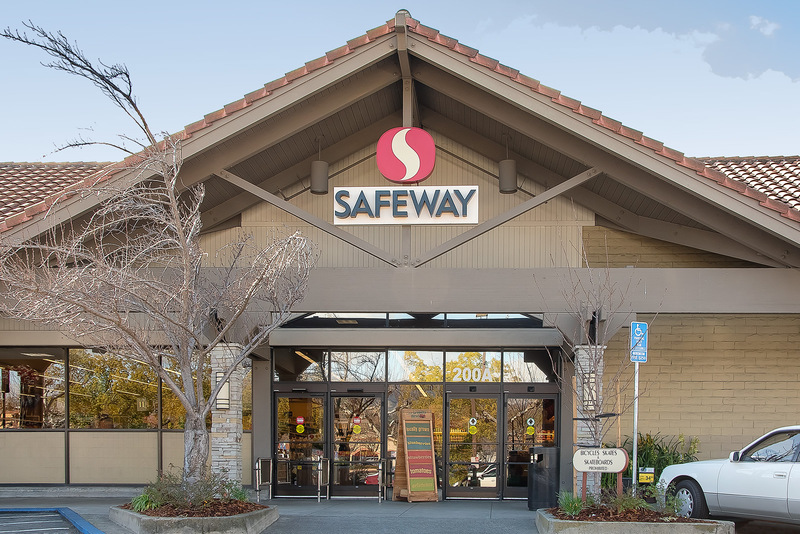 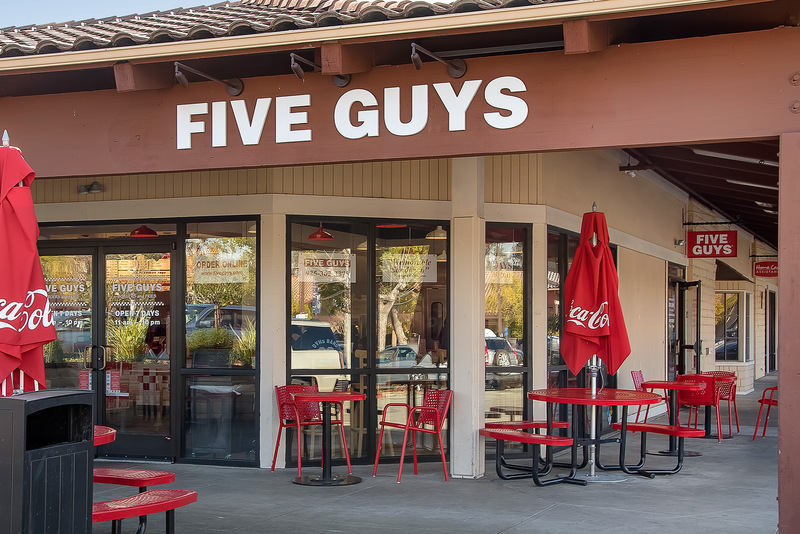 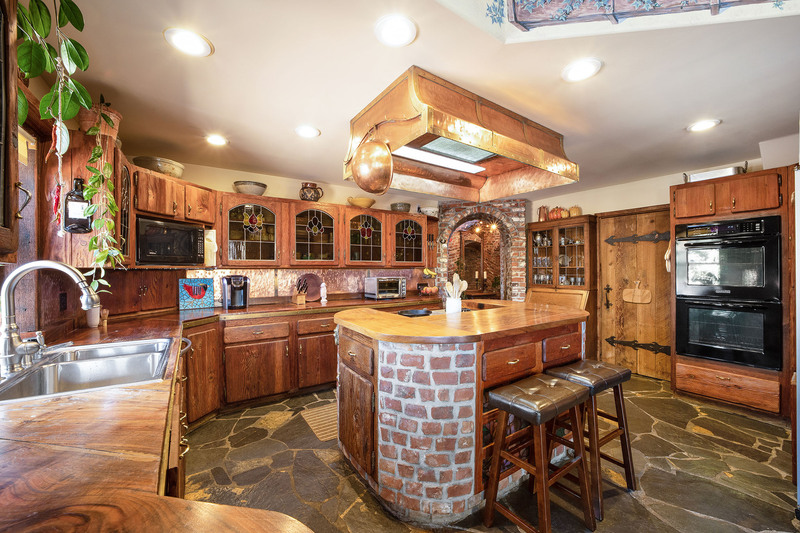 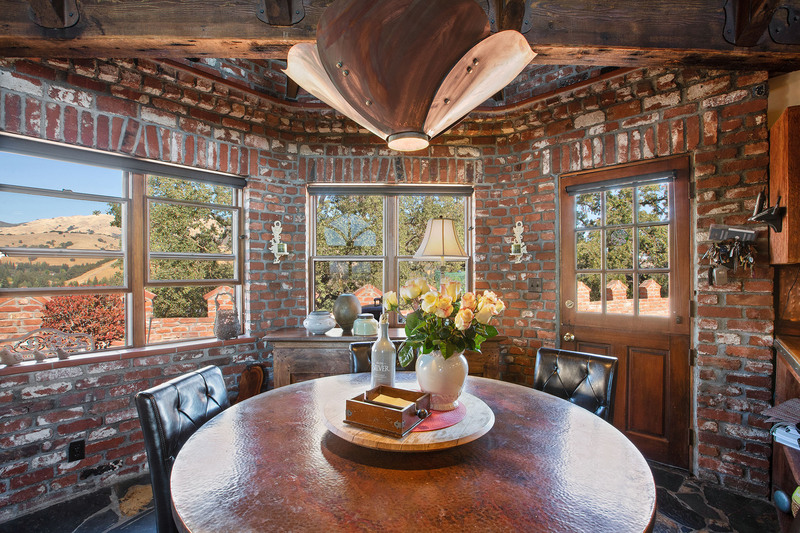 The cabinets are made of barn wood, retrieved from the Napa Valley, which were roughened up with a wire brush to bring out its distinctive grain. 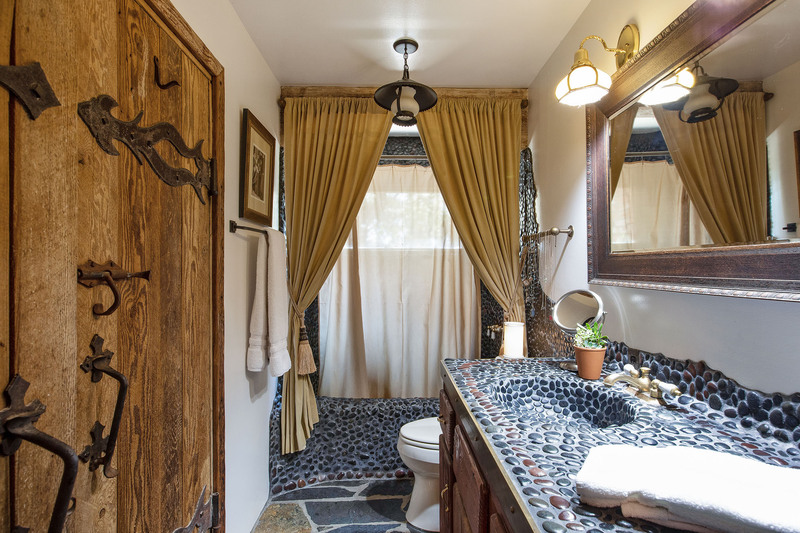 The stained glass cabinet fronts were individually designed and created by an artist. 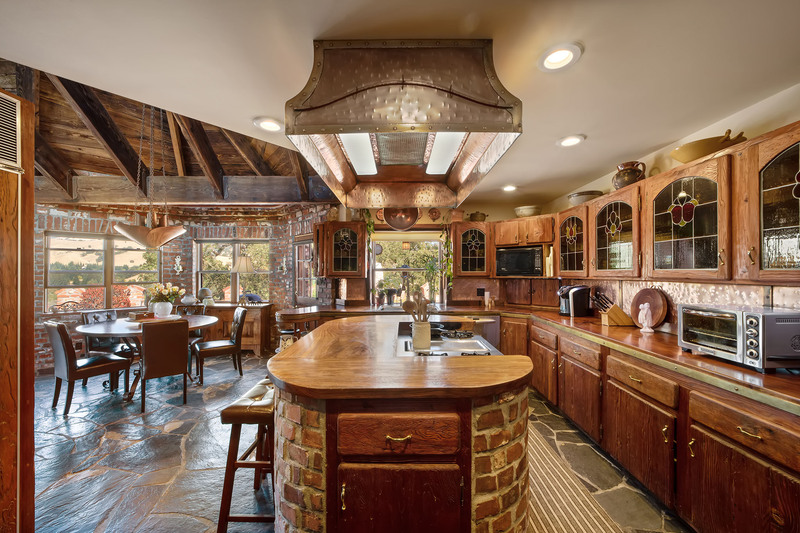 The smooth counter tops are made of cured walnut that came from trees cut down from a grove in Danville in the 1960’s. 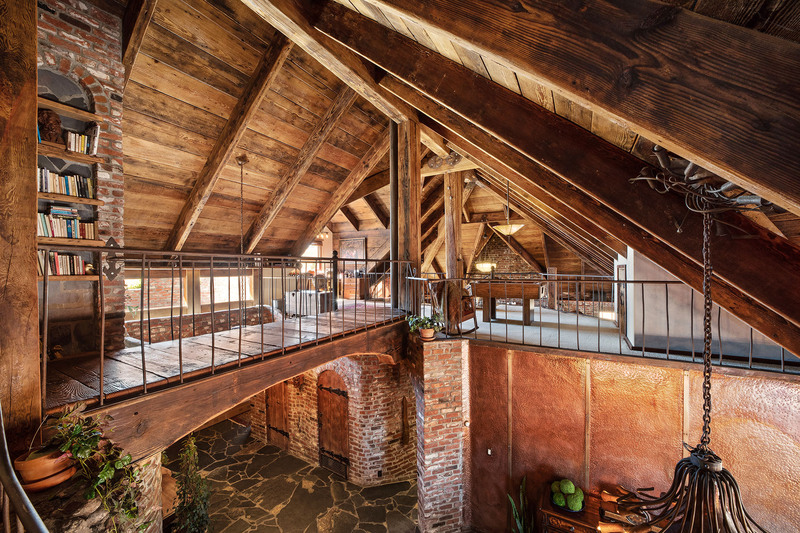 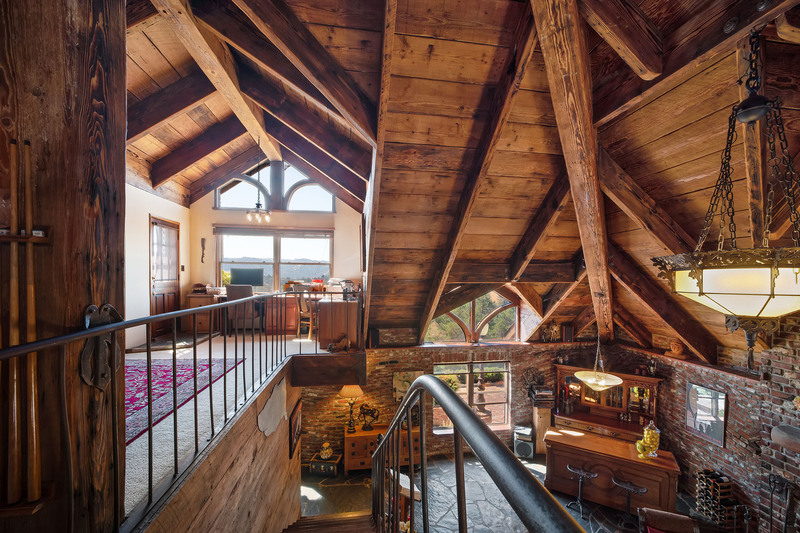 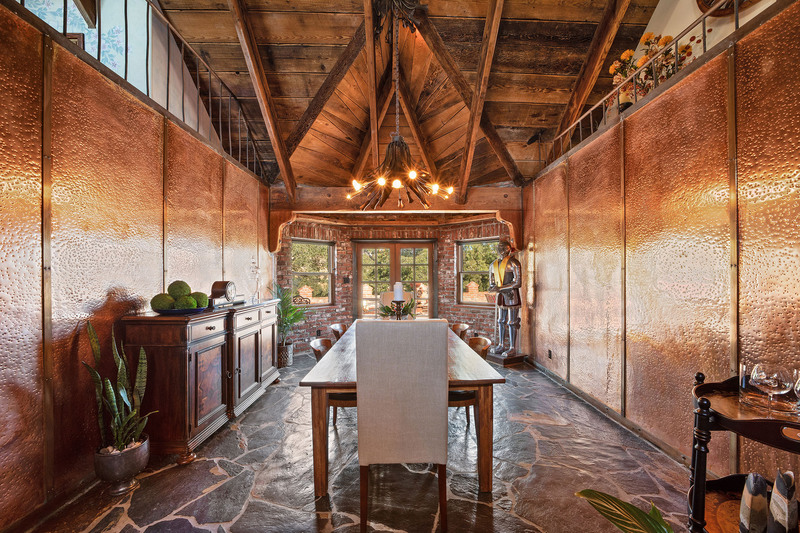 With its soaring 25’ ceilings this area is filled with many salvaged materials. 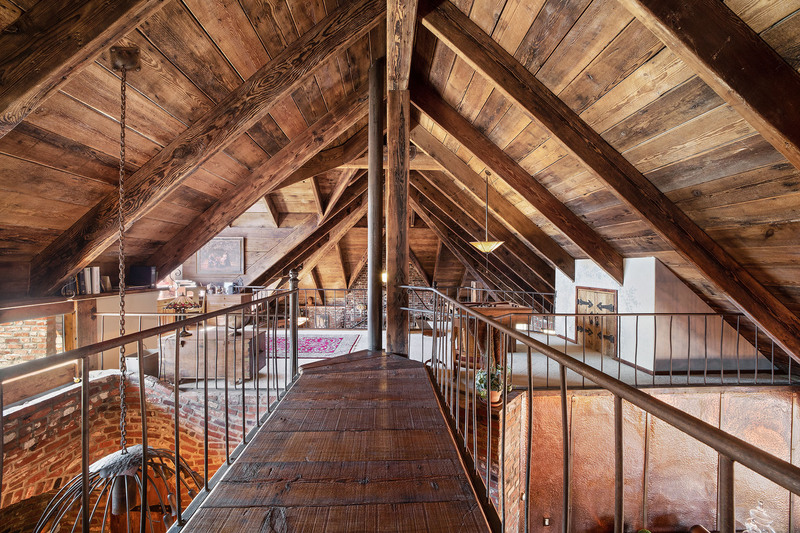 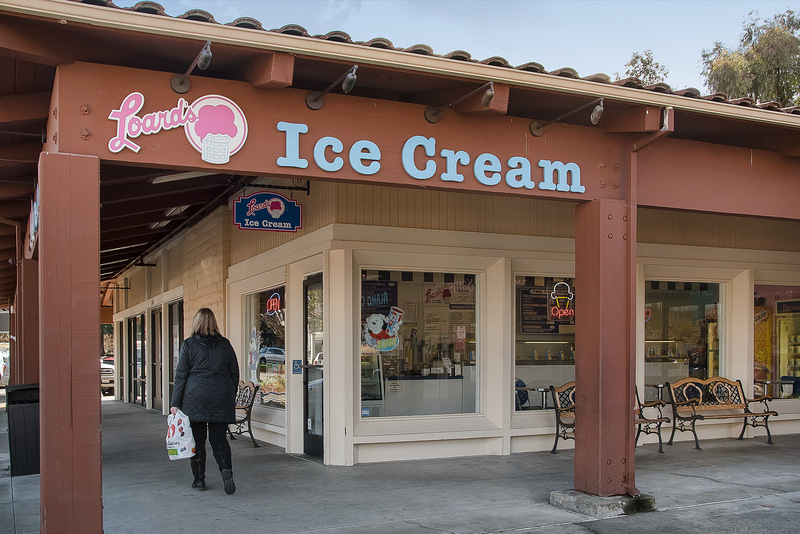 The spine and ribs of the home are made up of ridge beams, rafters and braces reclaimed from the shuttered JC Penny store in downtown San Francisco. 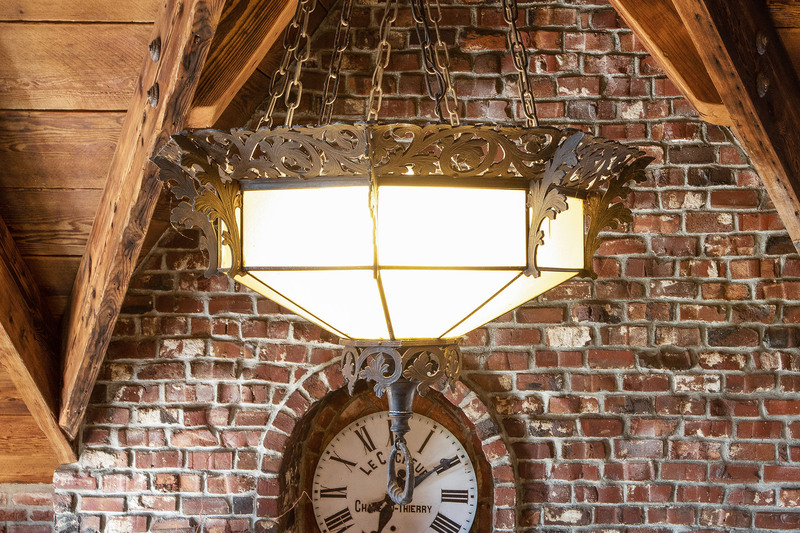 The central chandelier was the original light fixture retrieved from the Fremont High School gymnasium. 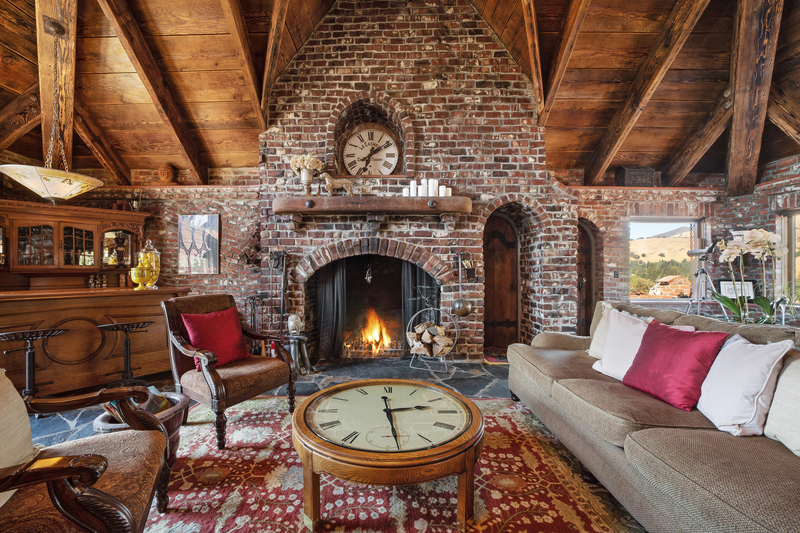 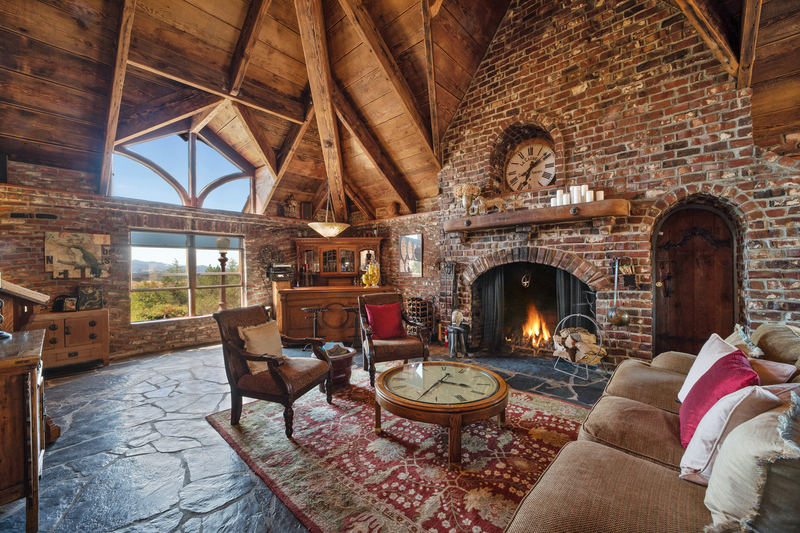 The massive wood-burning fireplace is adorned with a distinctive mantel that came from a bar in Jack London Square. 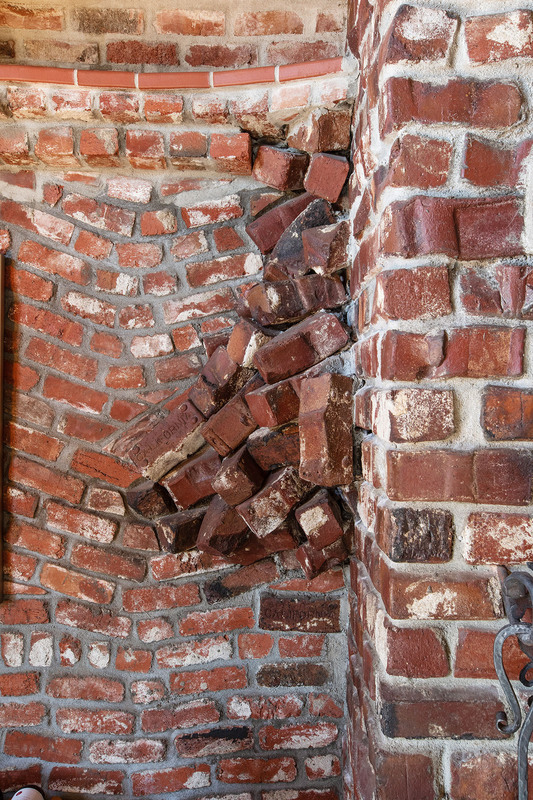 The “brick fall” came about by accident when a brick being put into place started to fall, was partially caught and landed at a crazy angle. 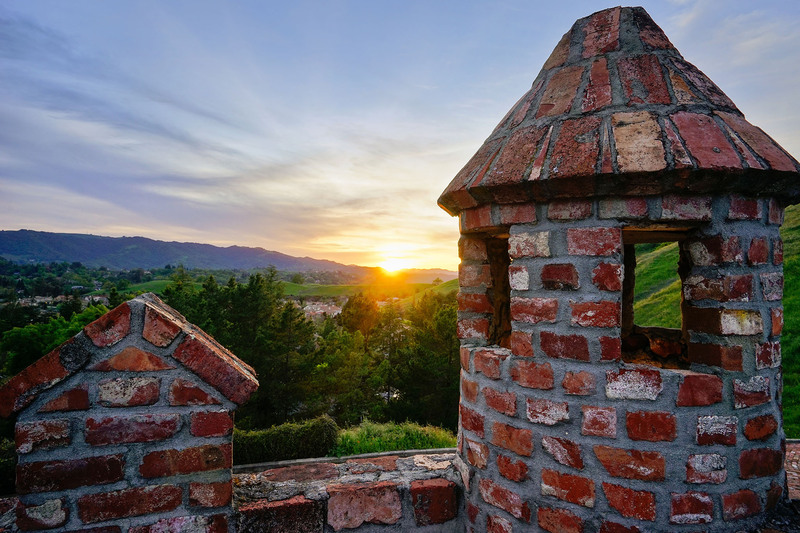 The bricklayer liked the angle and began to build upon it. 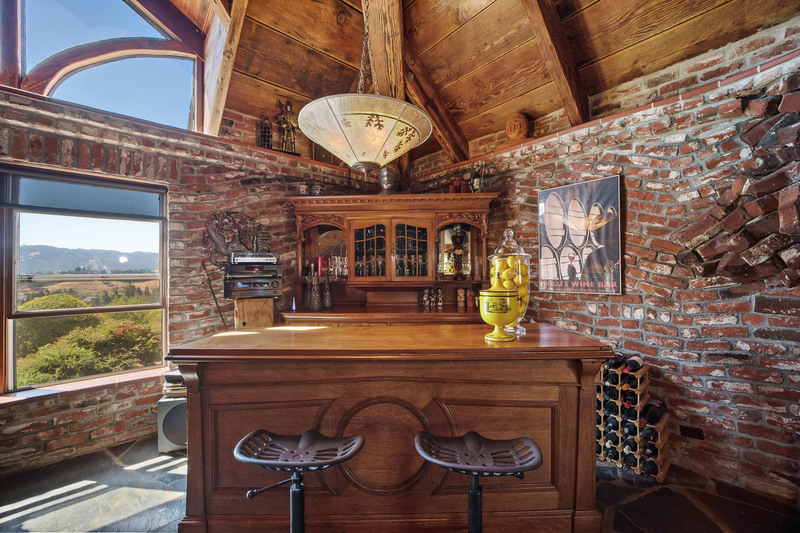 The same bricklayer left other souvenirs of his love for the grape as there are several places throughout the home embedded with wine bottles. 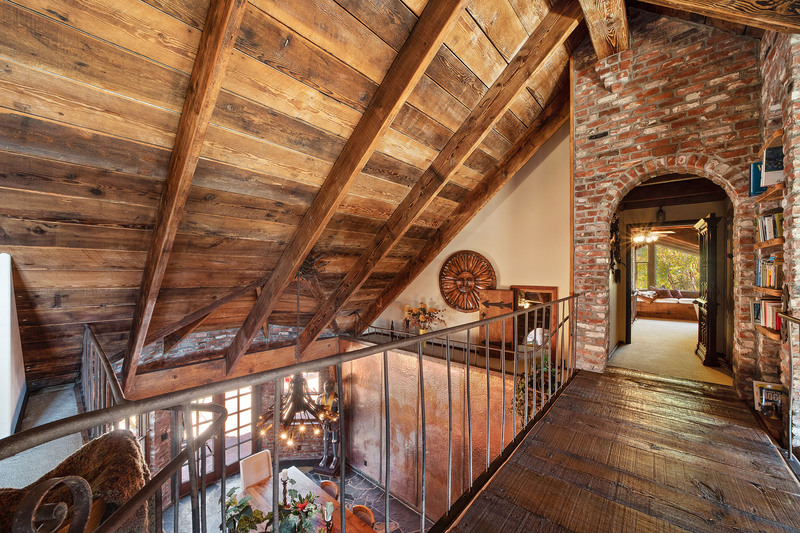 The stairs to the upper floor were originally church pews retrieved from a church in England that burned down. 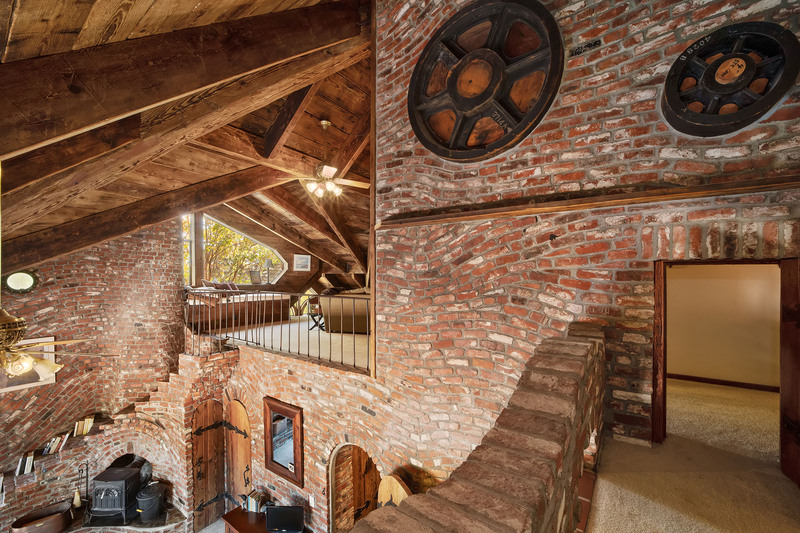 The banisters were made from the heavy steel rods that encircle large antique wine vats and the hand railings made from old fence pipe. 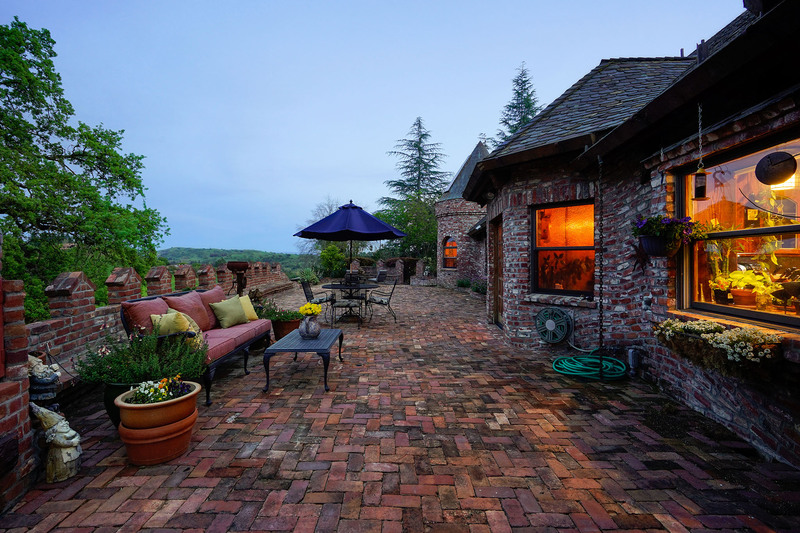 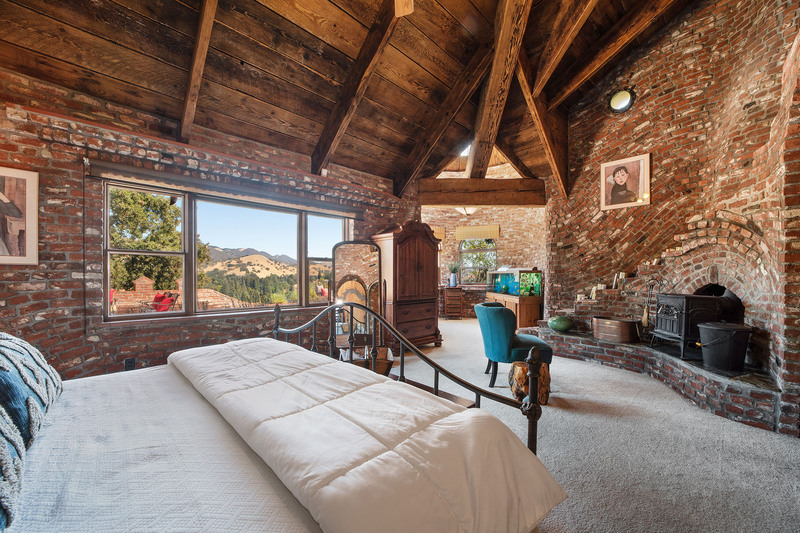 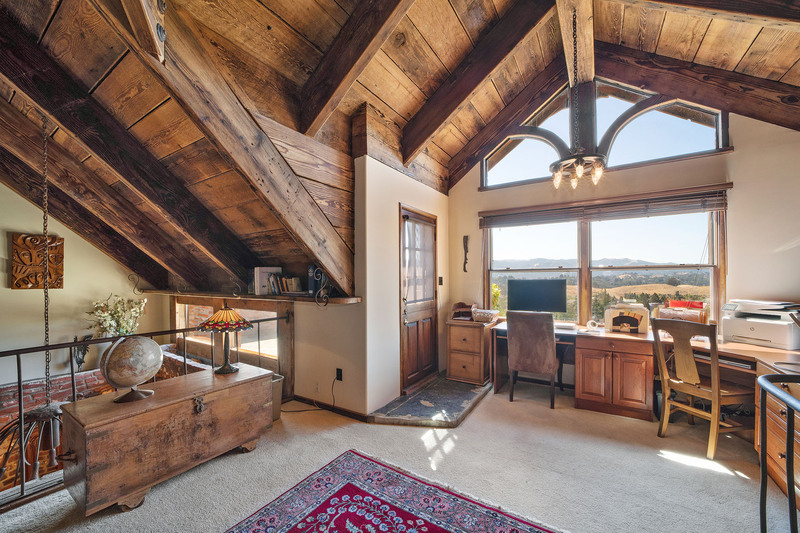 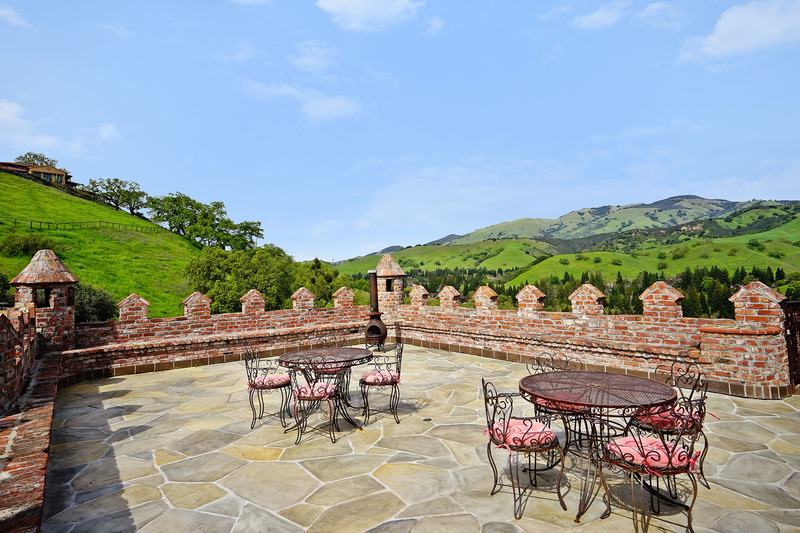 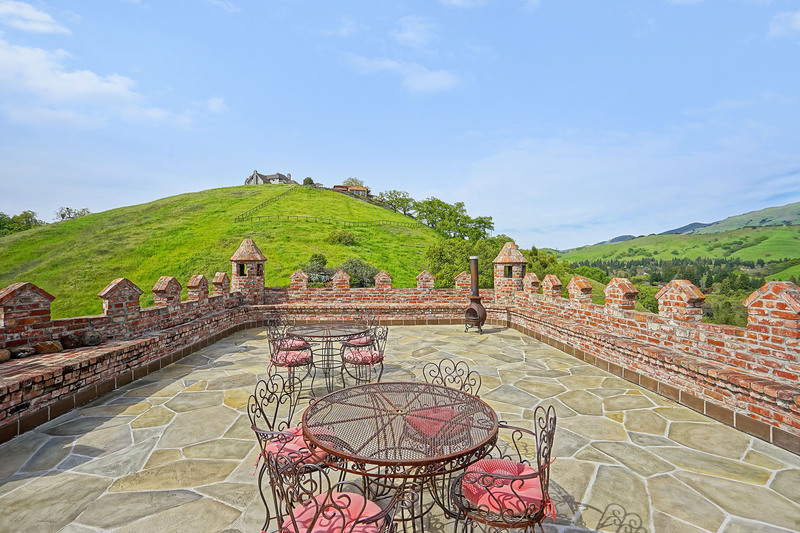 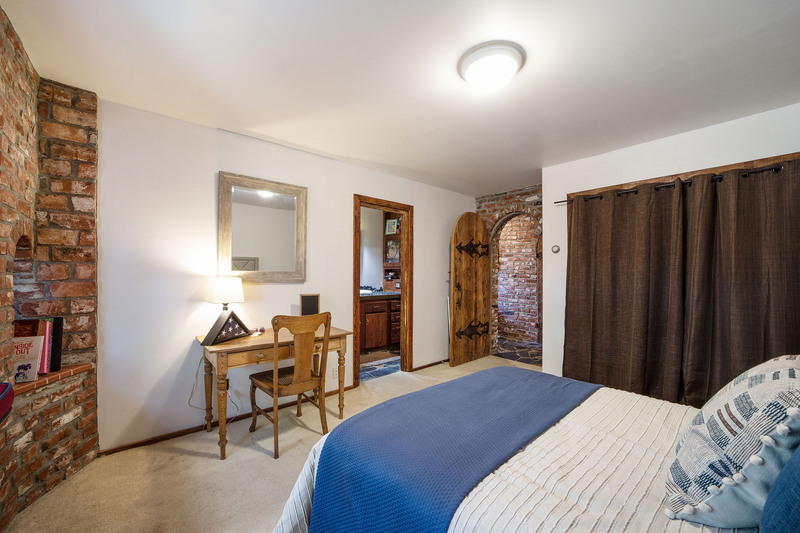 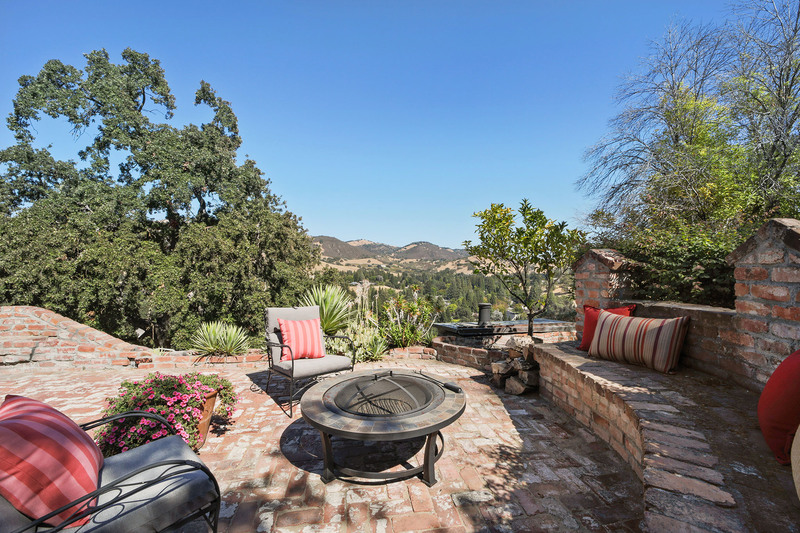 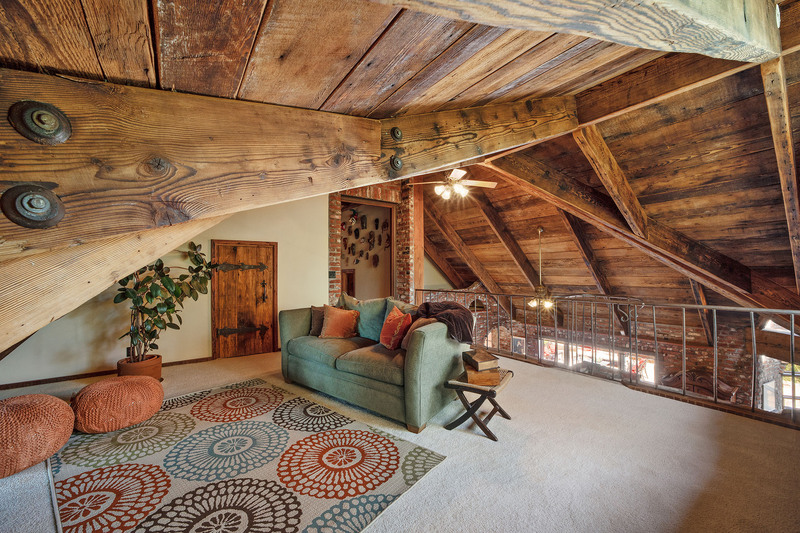 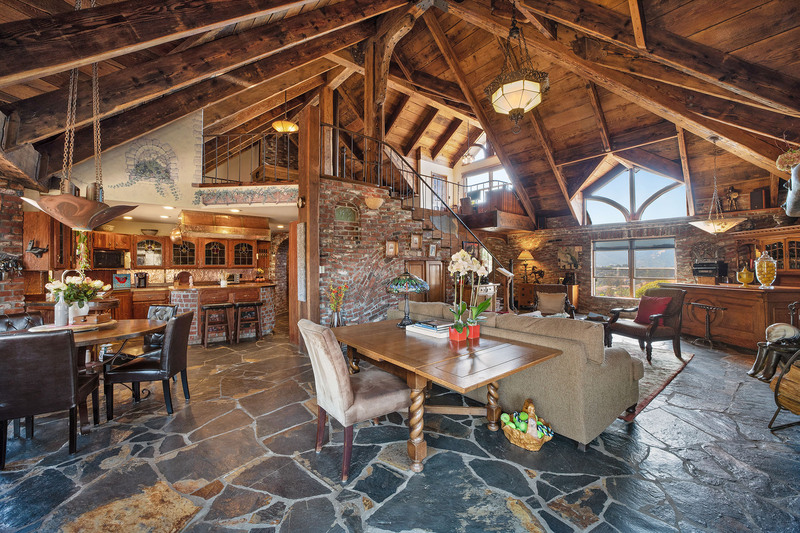 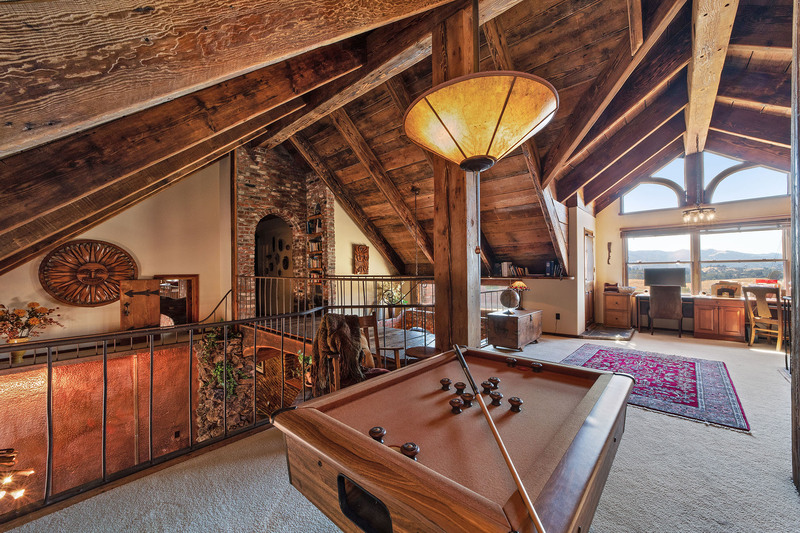 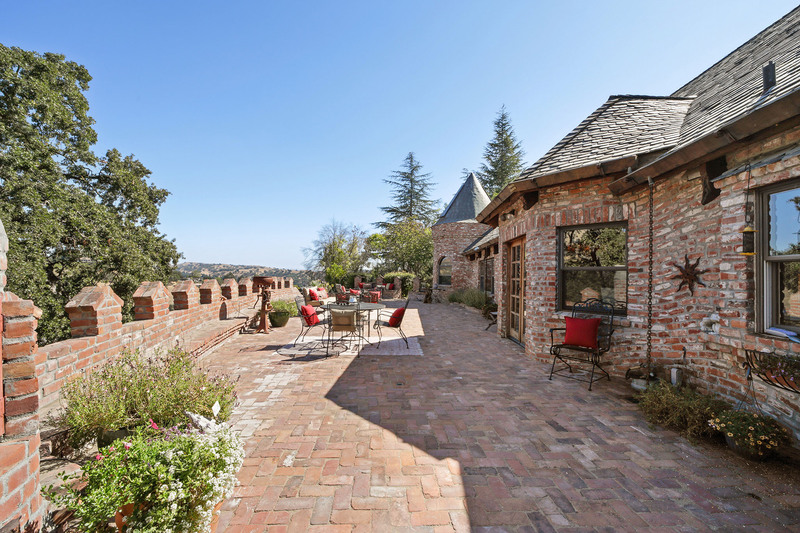 The loft has access to a private upstairs patio over looking the Las Trampas ridge and surrounding valleys. 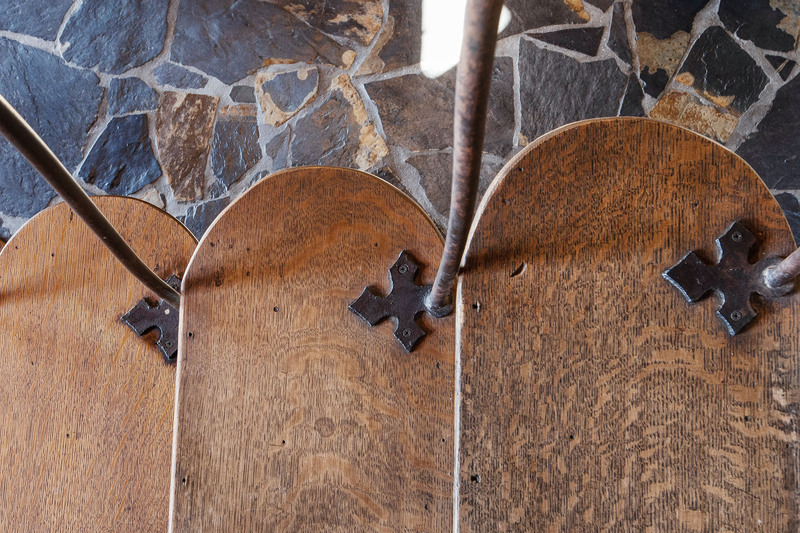 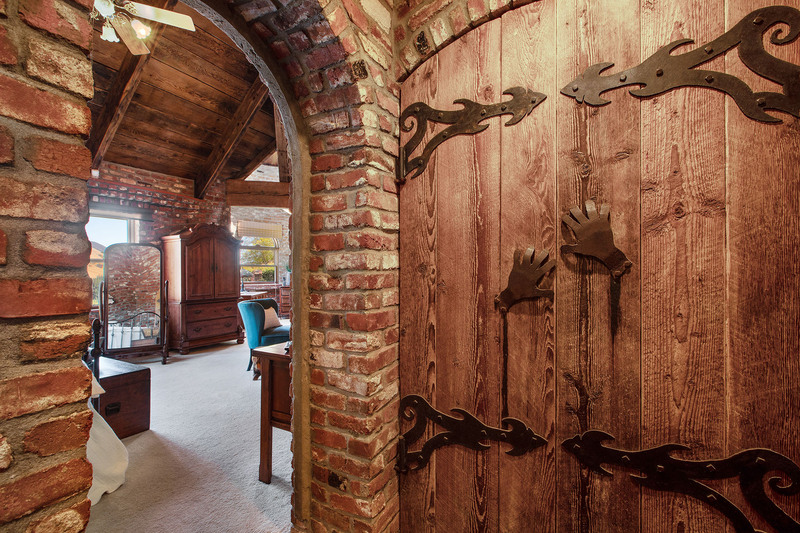 The dramatic confessional door leading to the retreat was retrieved from the same burned out church in England that yielded other items in the home. 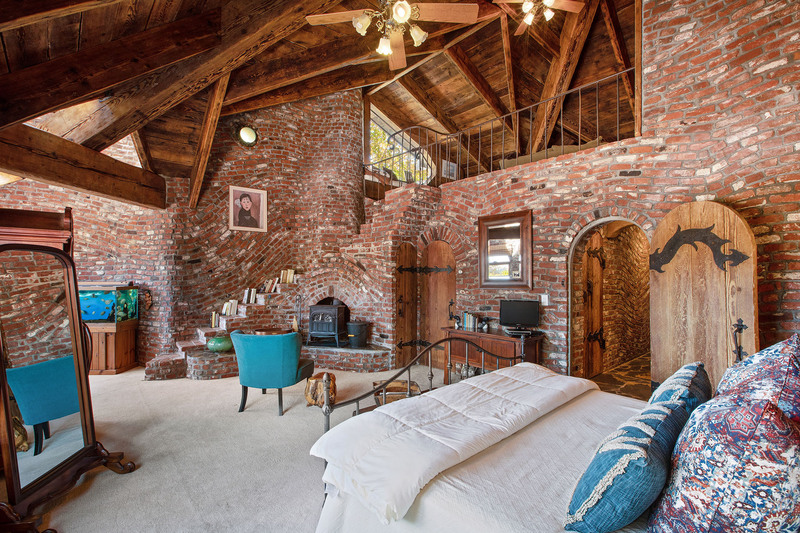 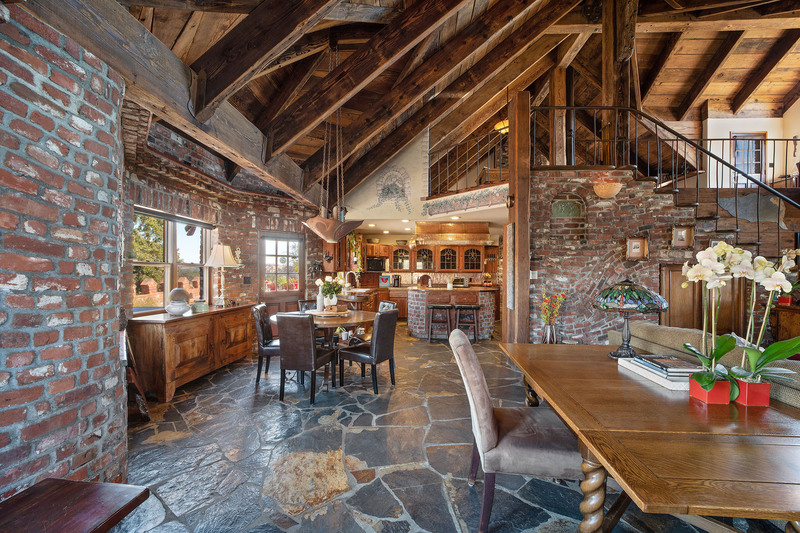 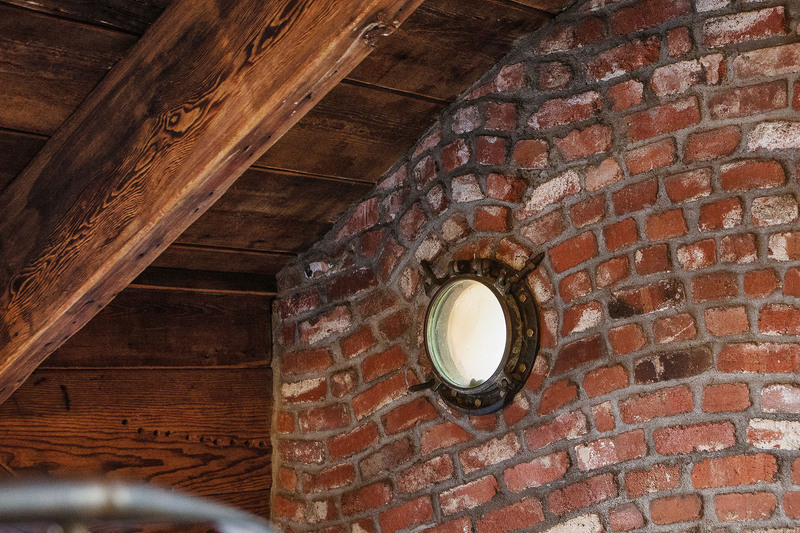 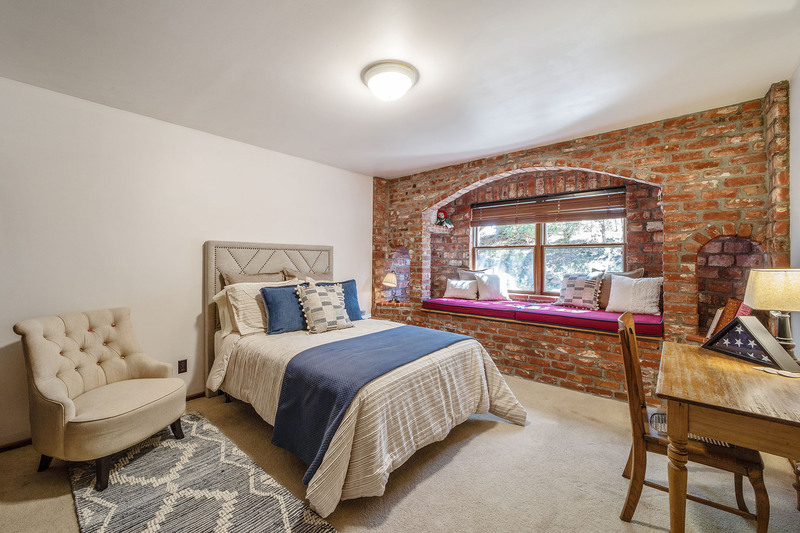 Home was built with over 120,000 used bricks many found in an old warehouse in downtown Oakland. 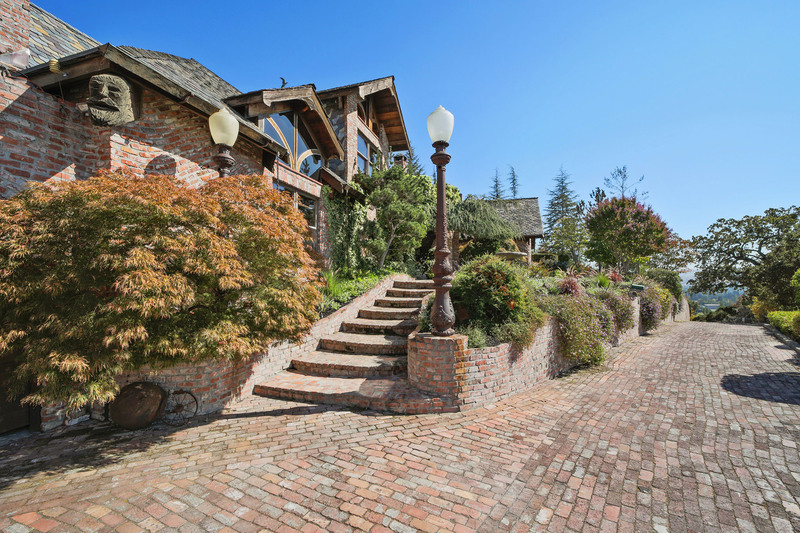 Stately exterior light posts at the front walkway came from Lake Merritt, circa 1910. 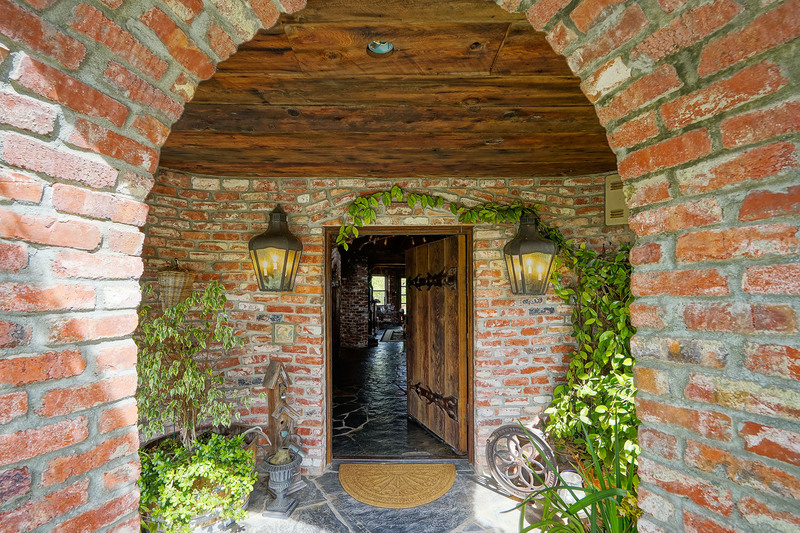 All interior doors are custom made for their particular location due to the creative brickwork throughout the home. 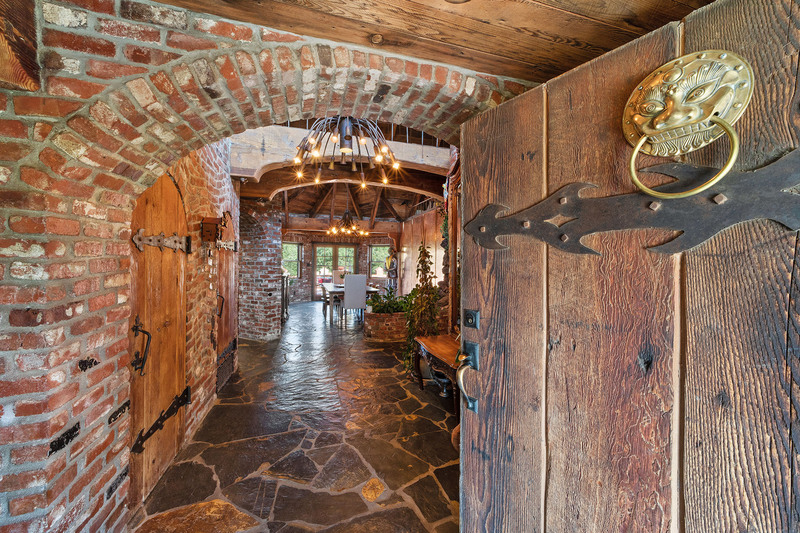 All door hinges and handles were individually fabricated on site. 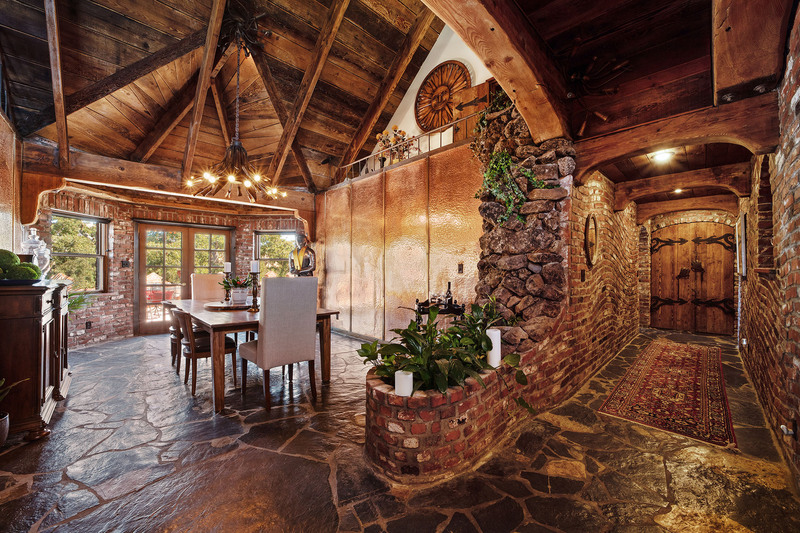 The slate used for the flooring and the roof came from China (80%) and Africa (20%). 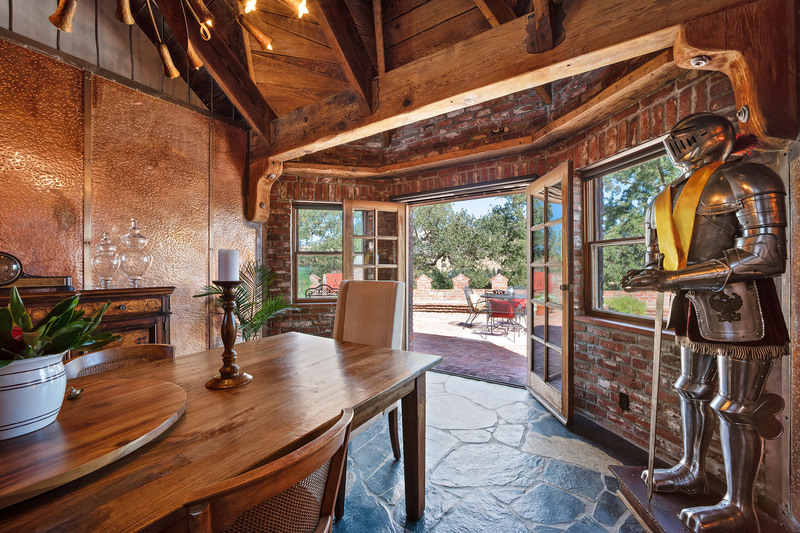 The flooring features radiant heat throughout the home. 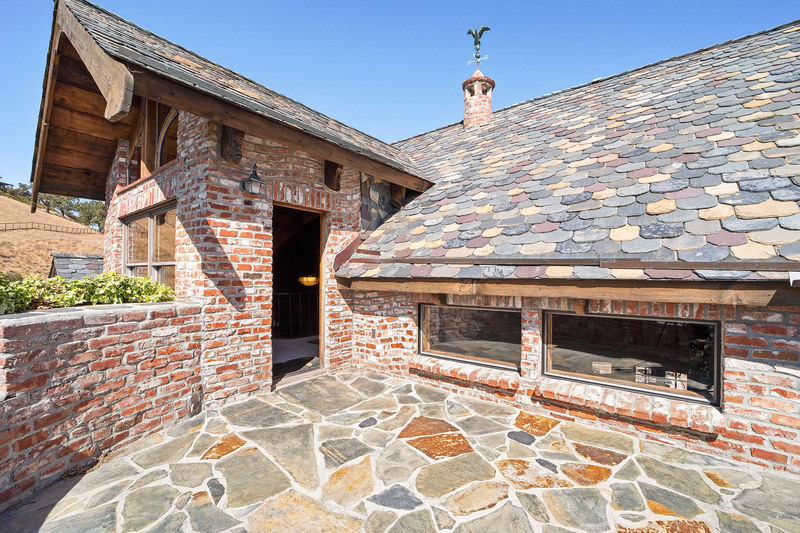 The slate roof was all hand chipped to give it an aged look. 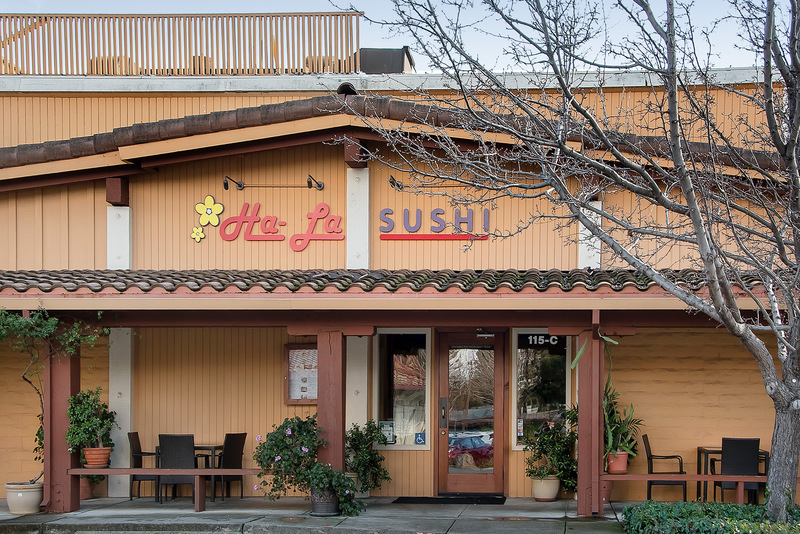 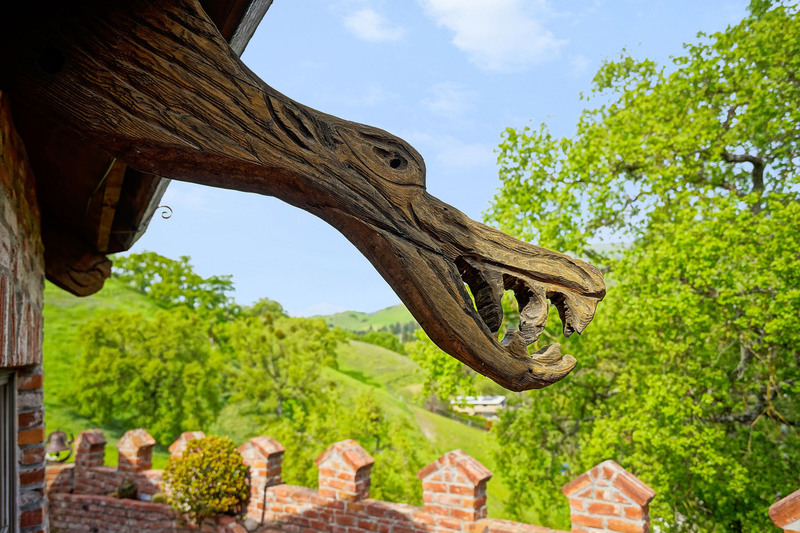 The exterior gutters are made of redwood and are lined with copper. 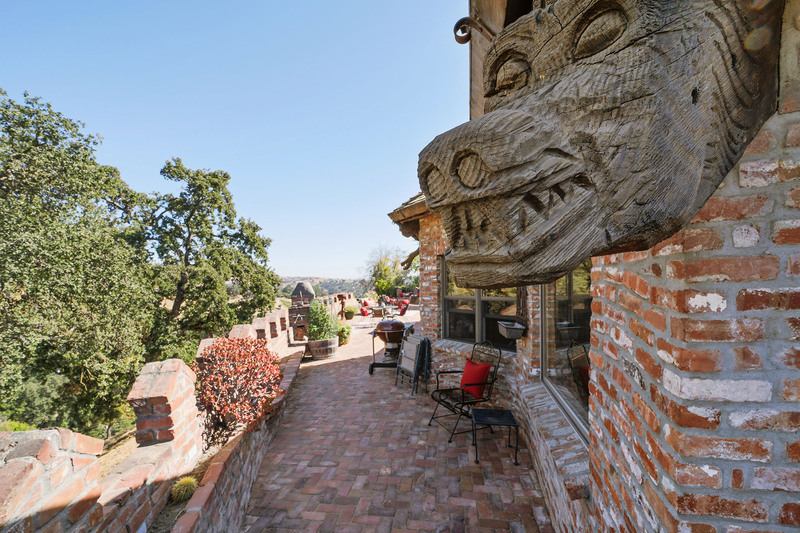 The roof rafters exposed outside the home were salvaged from an abandoned Oakland Army Depot and all indiviually hand-carved with interesting faces, animals, and objects. 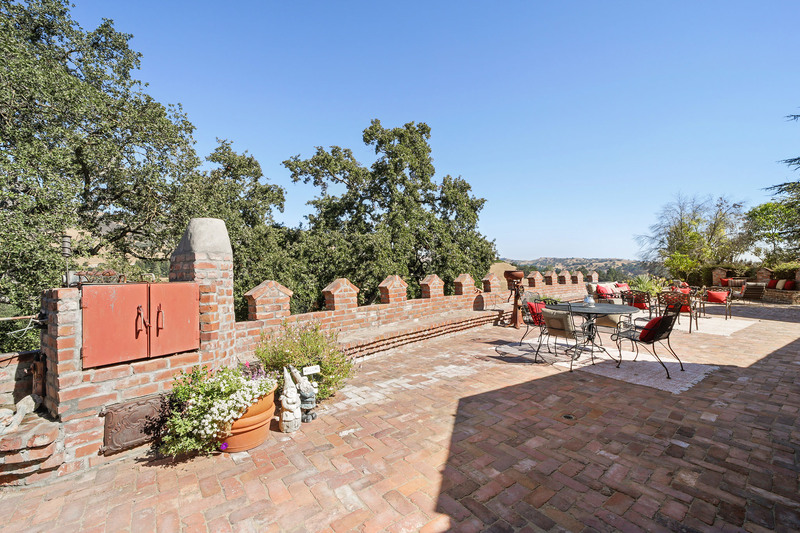 The expansive deck over garage offers a nearly 360-degree view from majestic Mt. 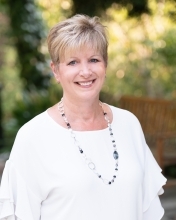 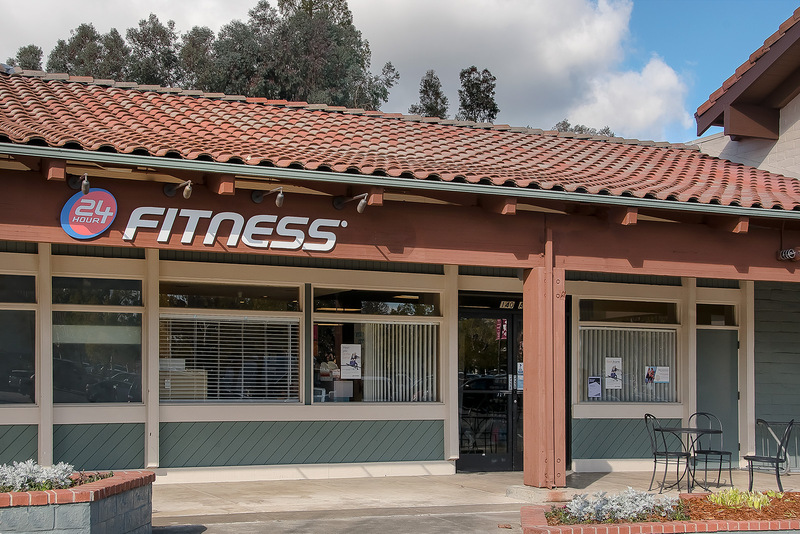 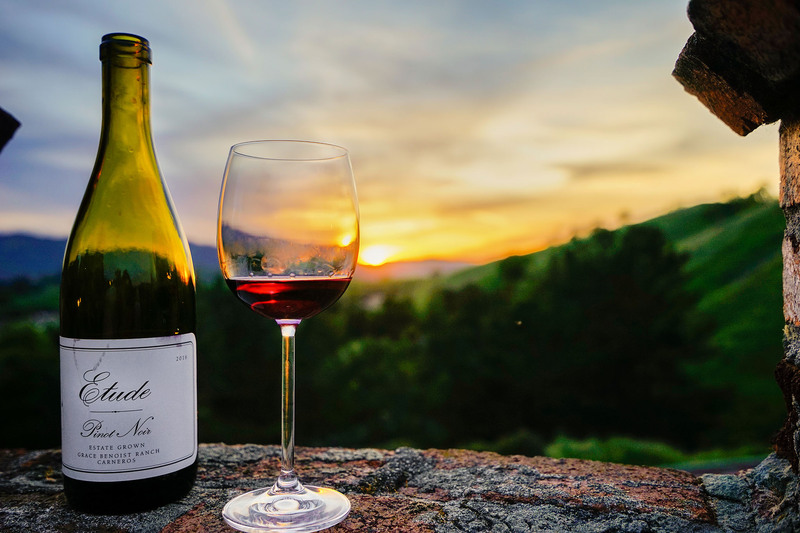 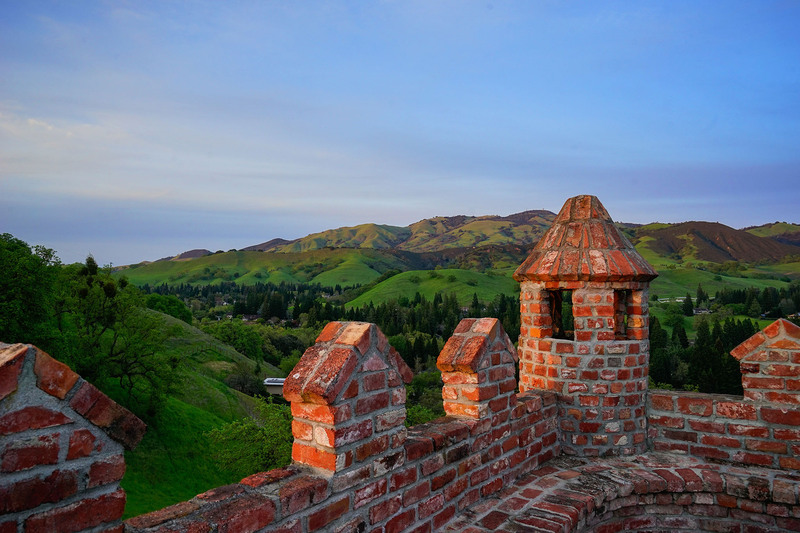 Diablo to the San Ramon Valley and beyond as well as stunning sunrise and sunset vistas. 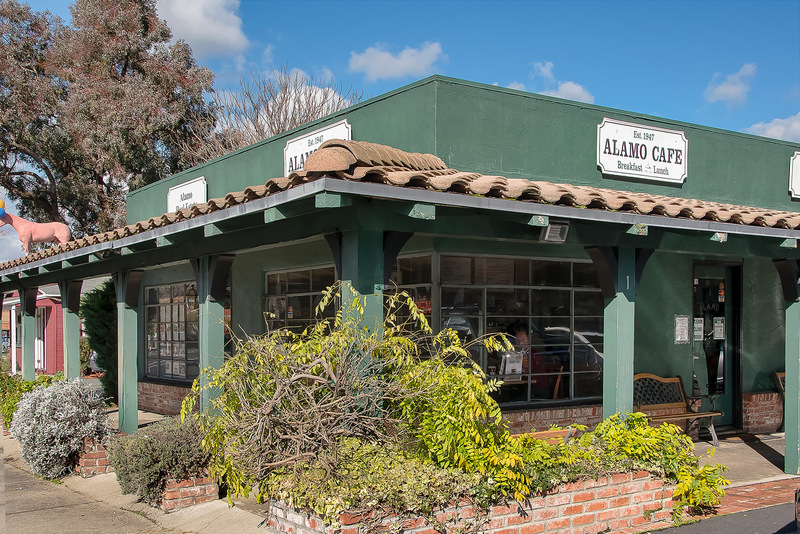 In Alamo, an unincorporated area of Contra Costa County, you can see kids riding their horses along the sandy streets of the outer neighborhoods. 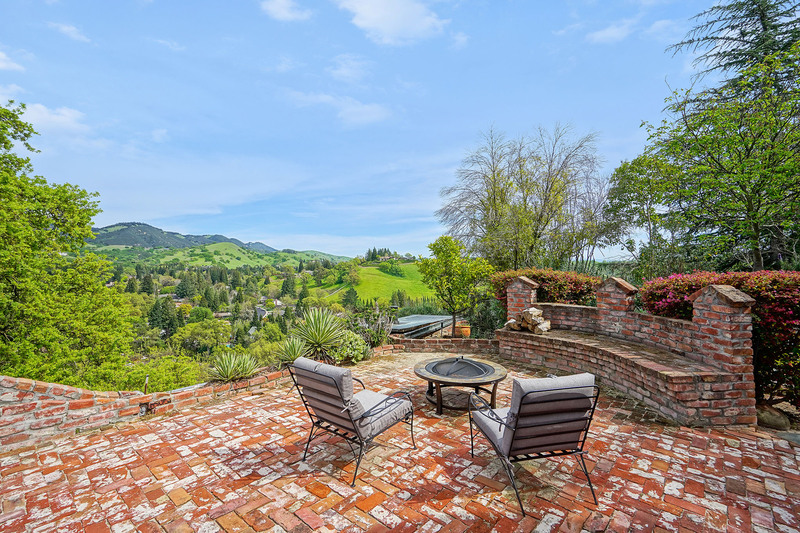 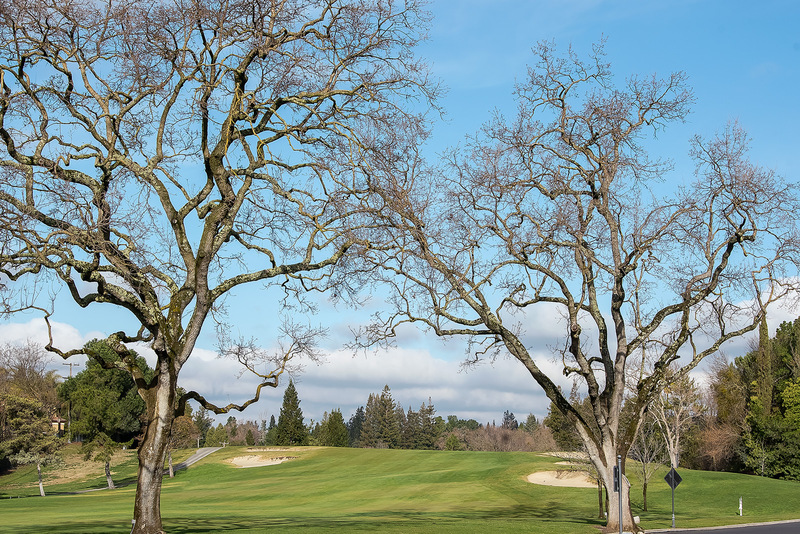 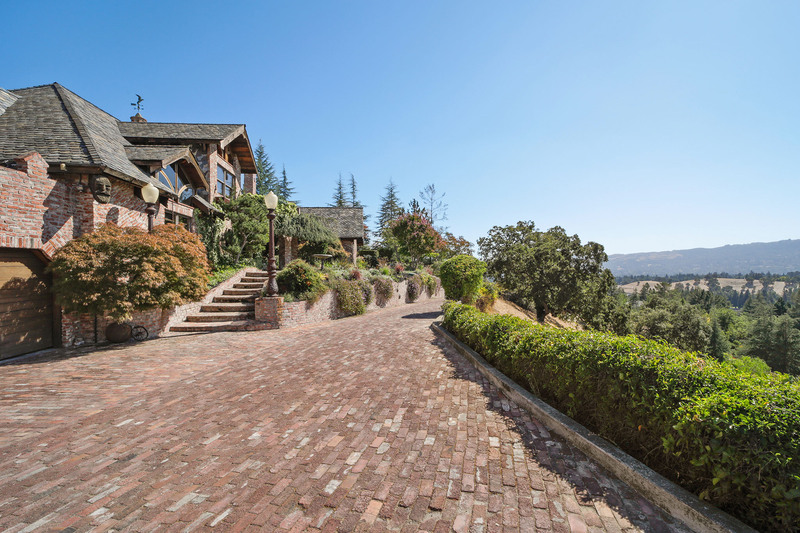 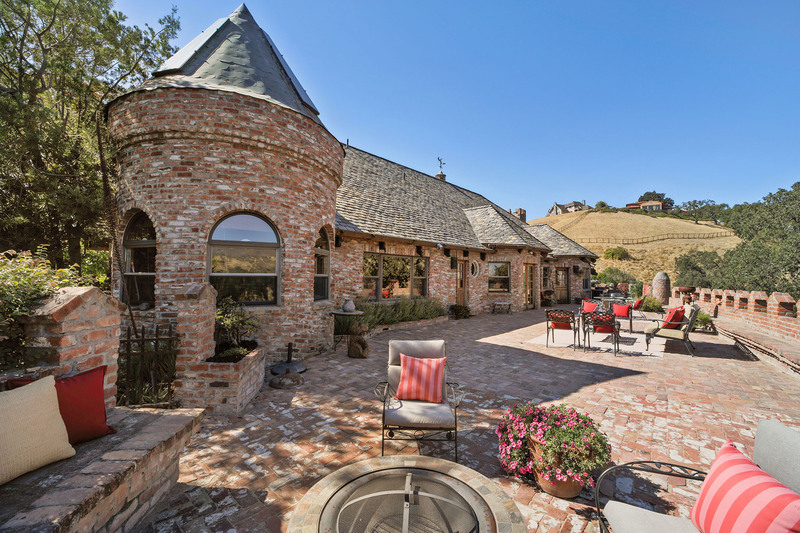 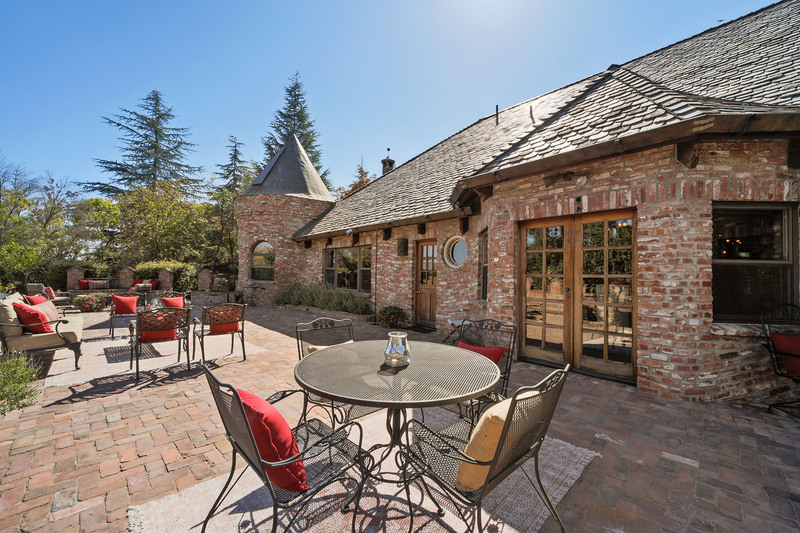 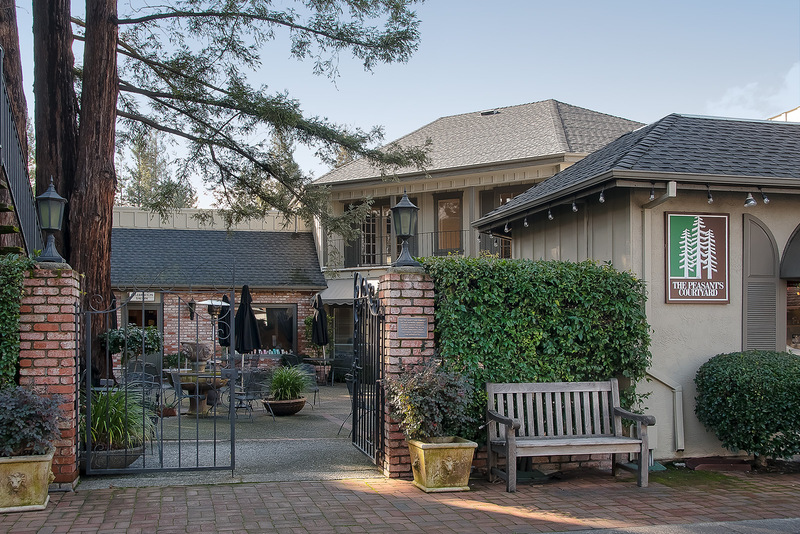 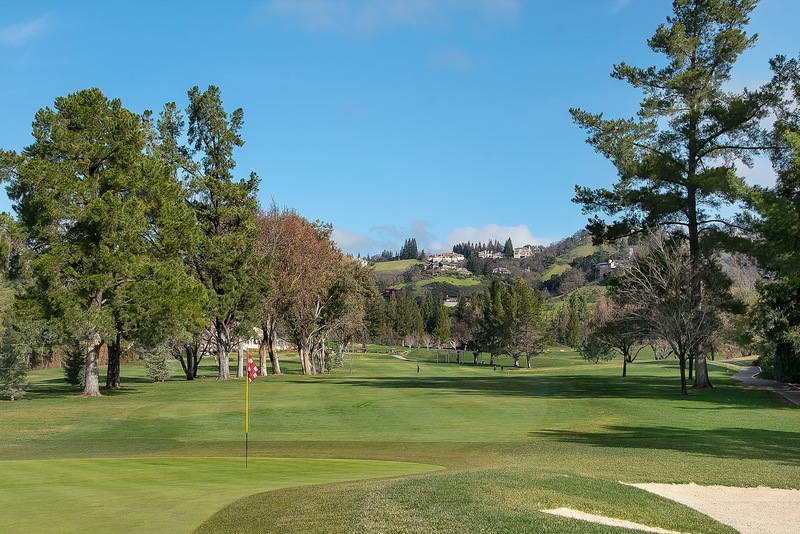 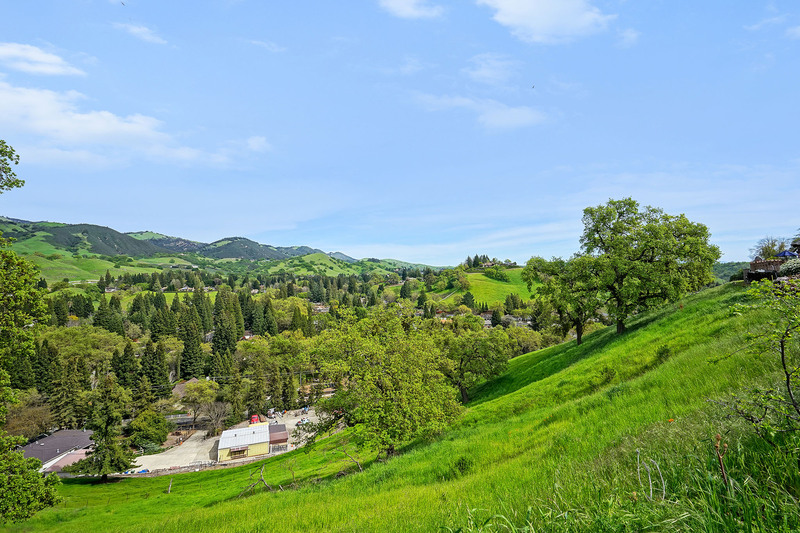 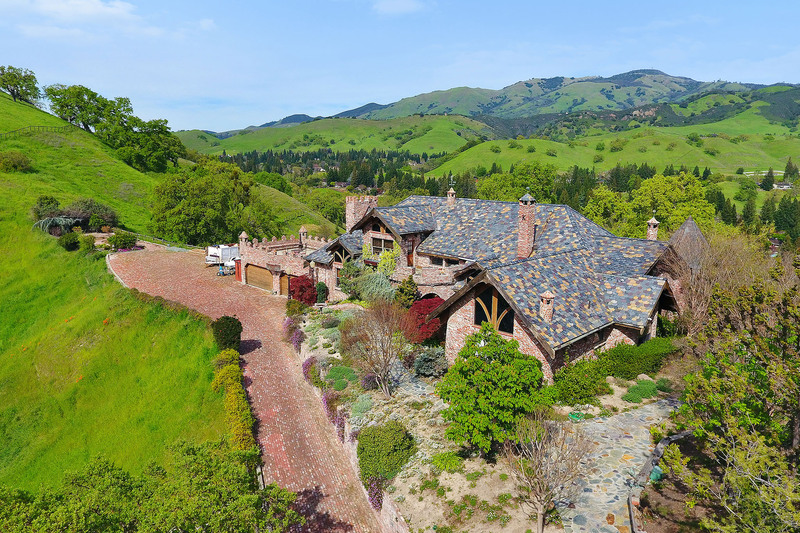 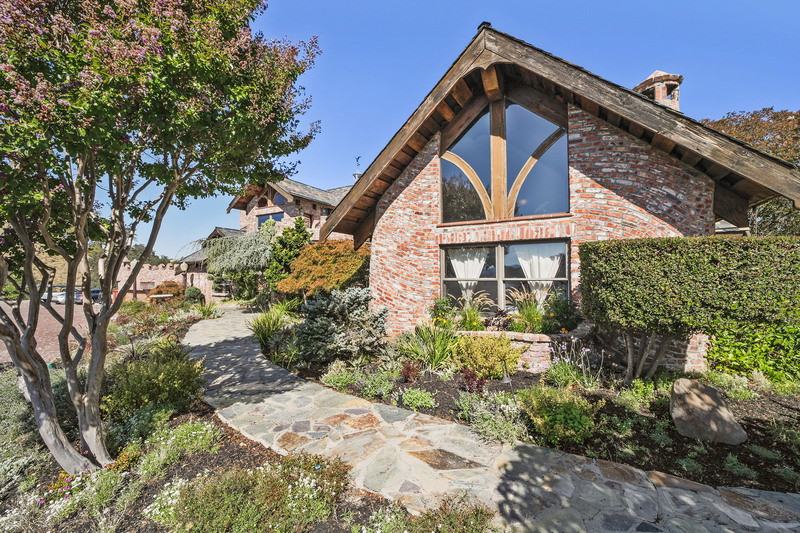 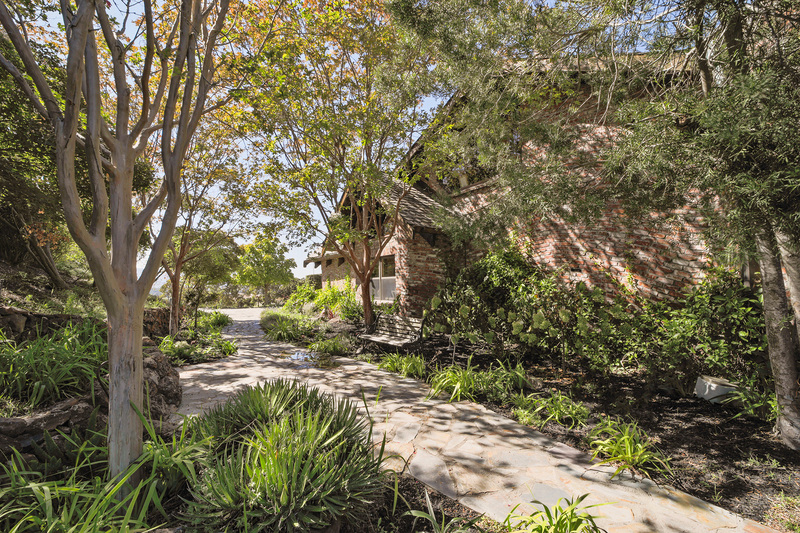 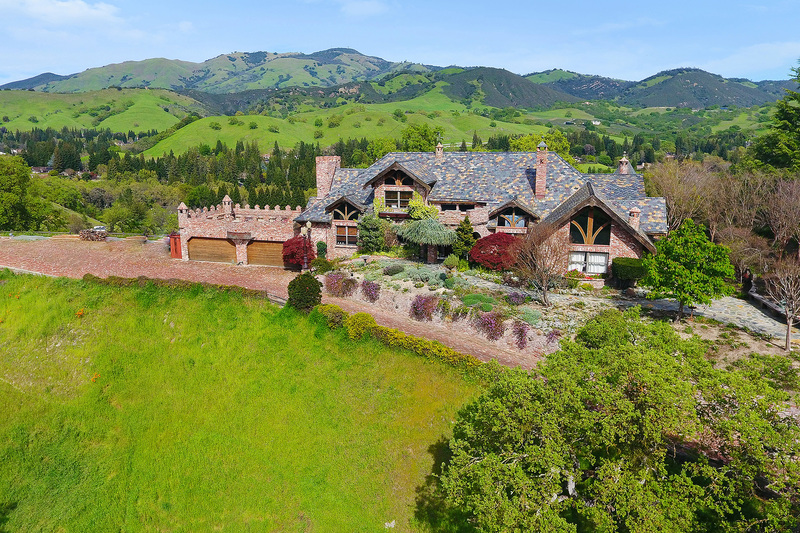 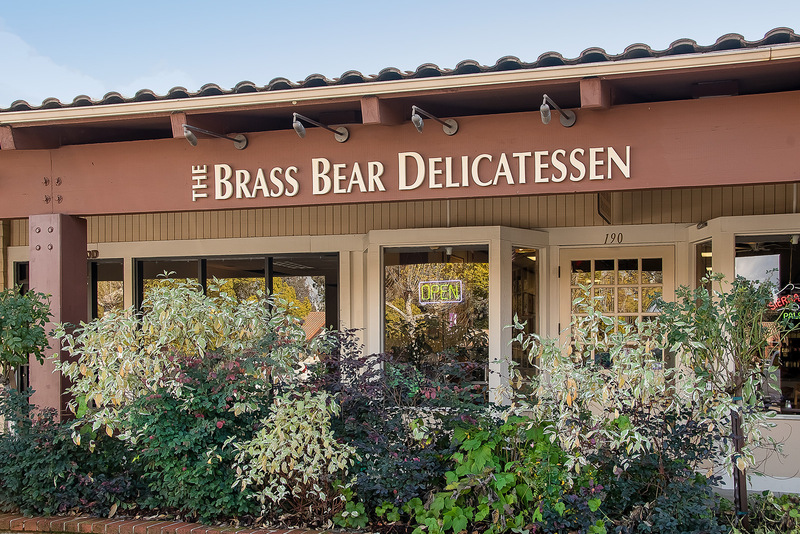 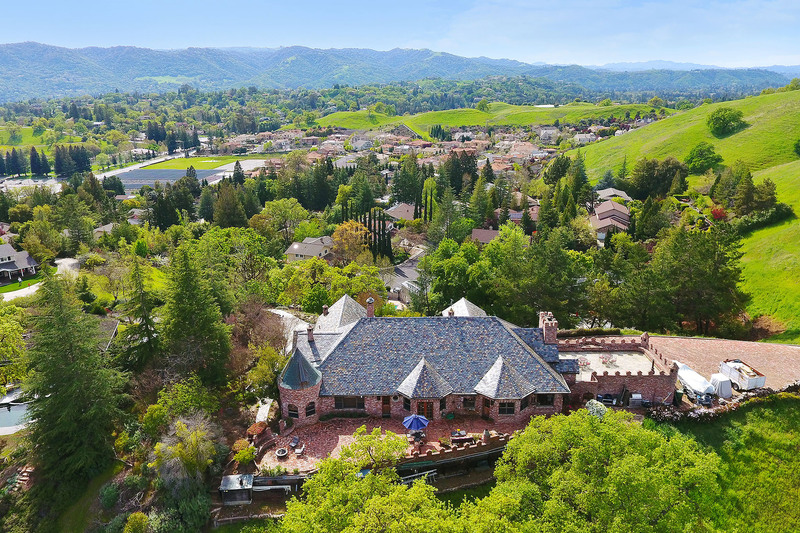 Large, custom homes in contemporary and French Country styles on half-acre lots define this tranquil town in set amongst the Northern California oak countryside. 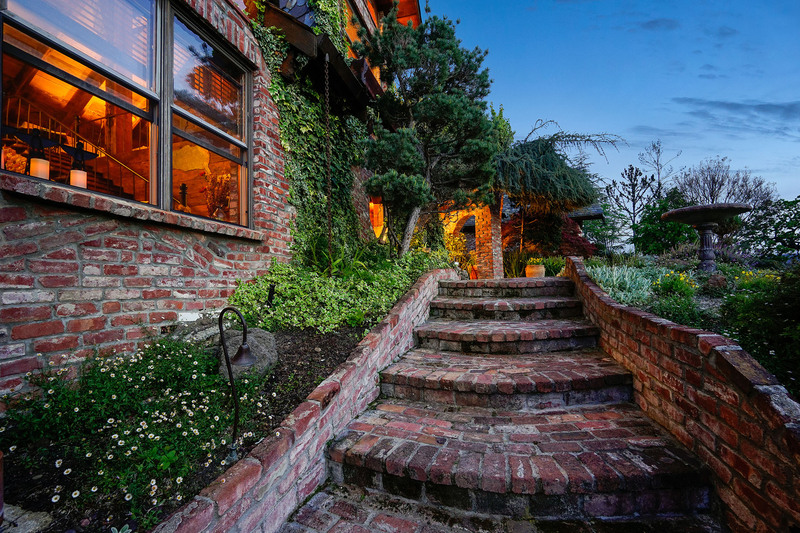 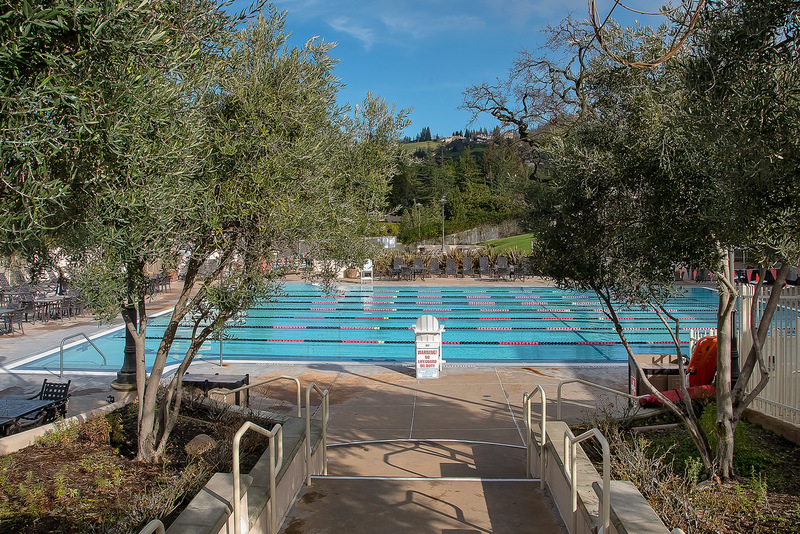 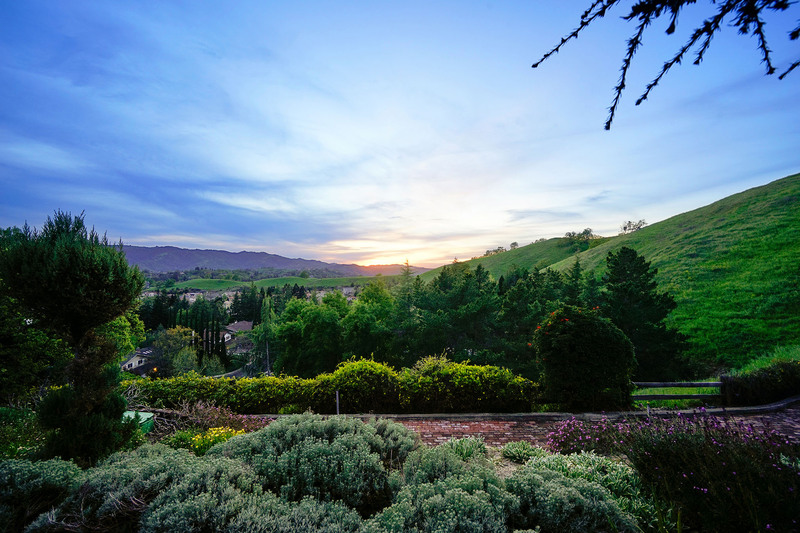 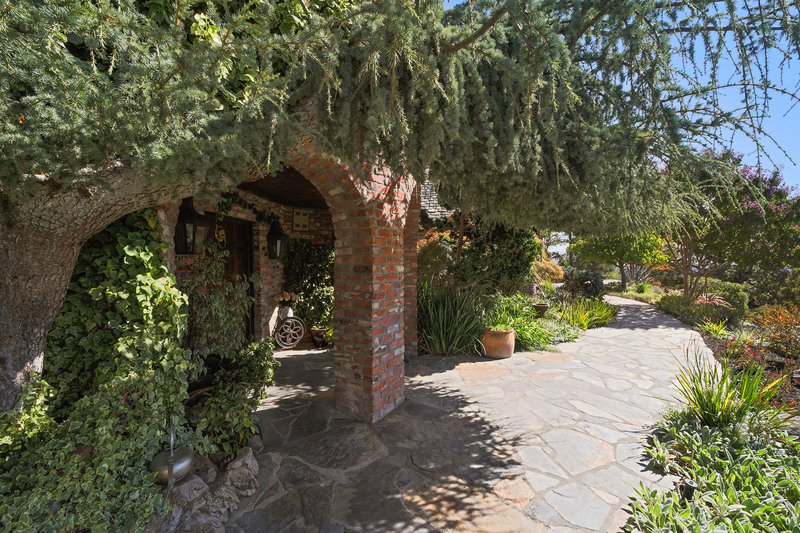 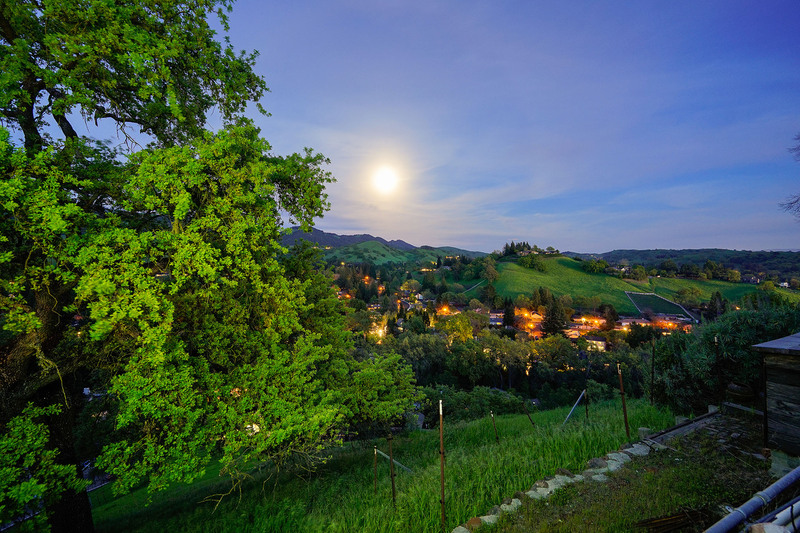 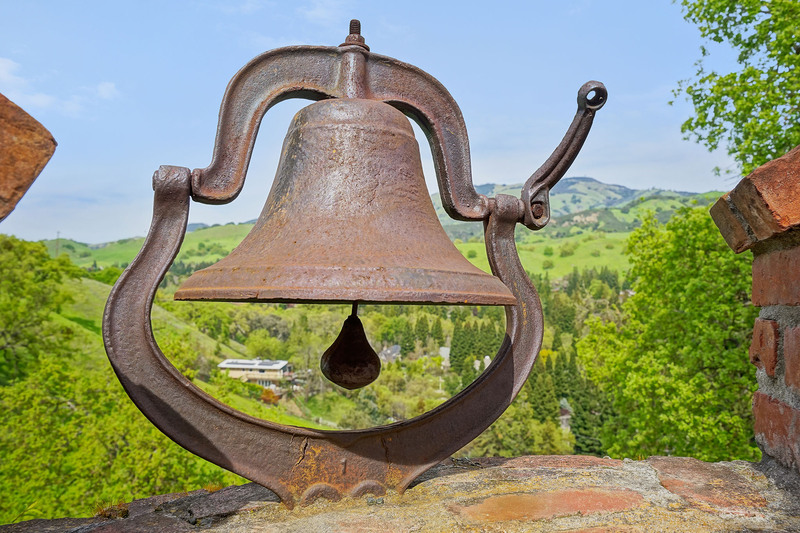 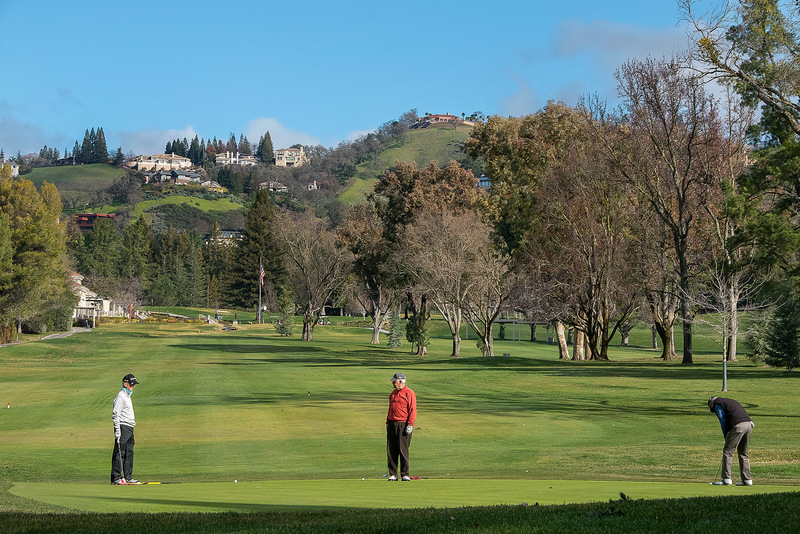 At the foot of Mount Diablo, Alamo offers seclusion, serenity, and tranquility. 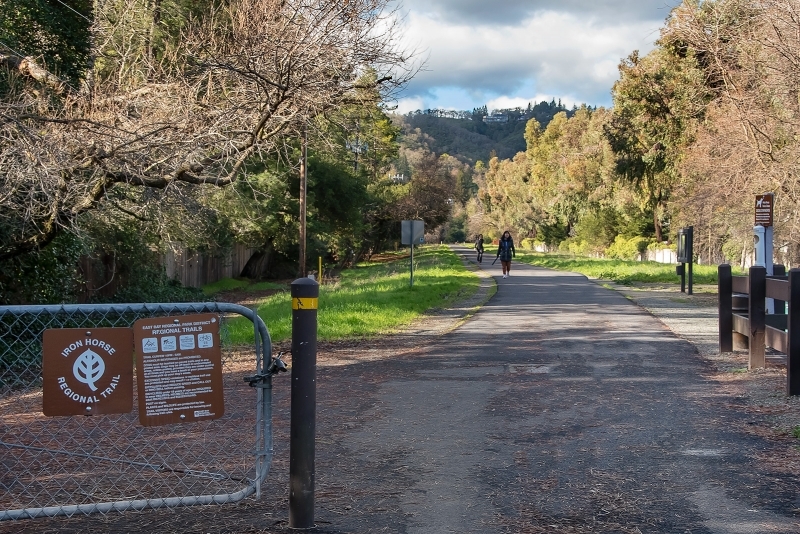 Parks and trails are plentiful, including The Iron Horse Trail, a 33-mile multiuse pathway that connects the communities of Concord and Dublin. 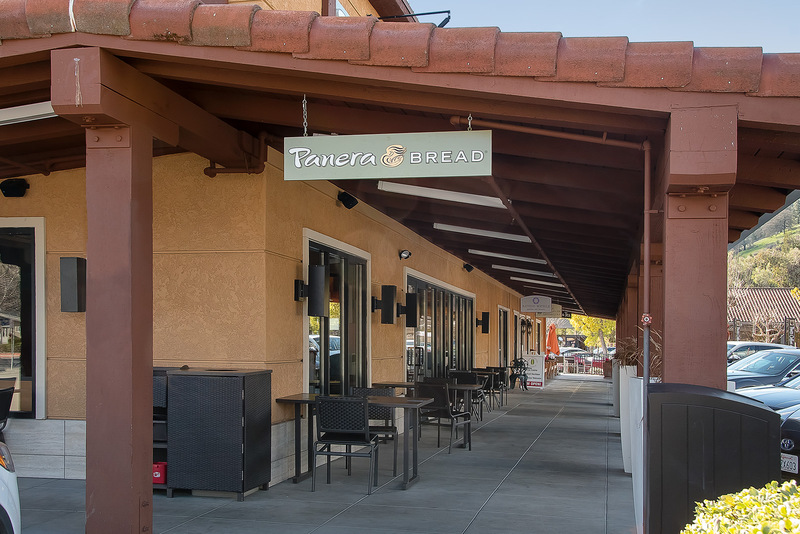 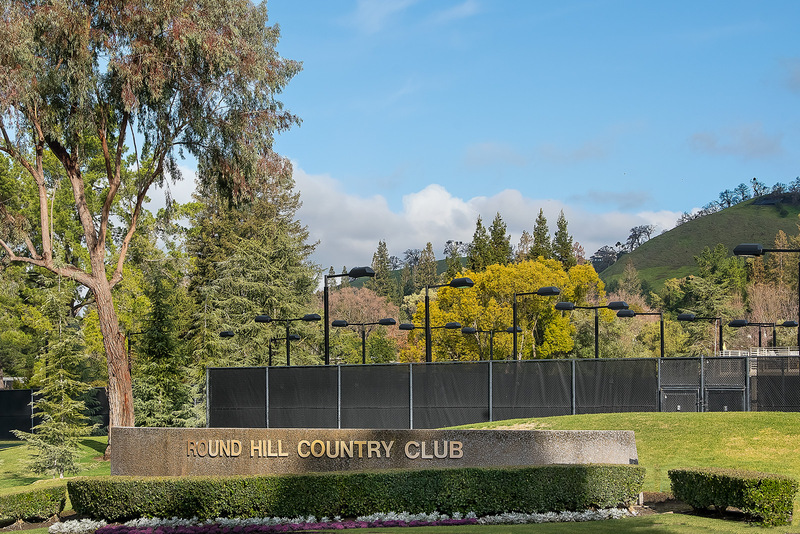 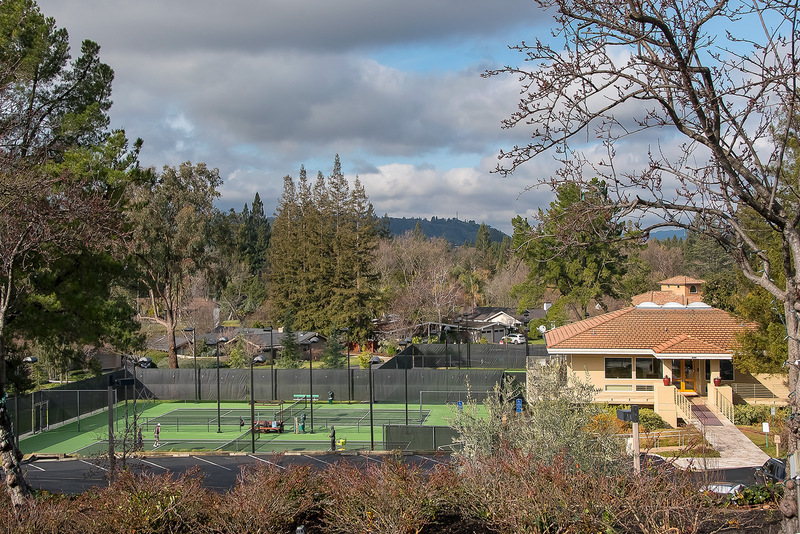 Andrew H. Young Park, Hap Magee Ranch Park, Livorna Park, and Rancho Romero School Sports Field and Park feature volleyball courts, picnic and barbecue areas, open-air gazebos, and dog parks. 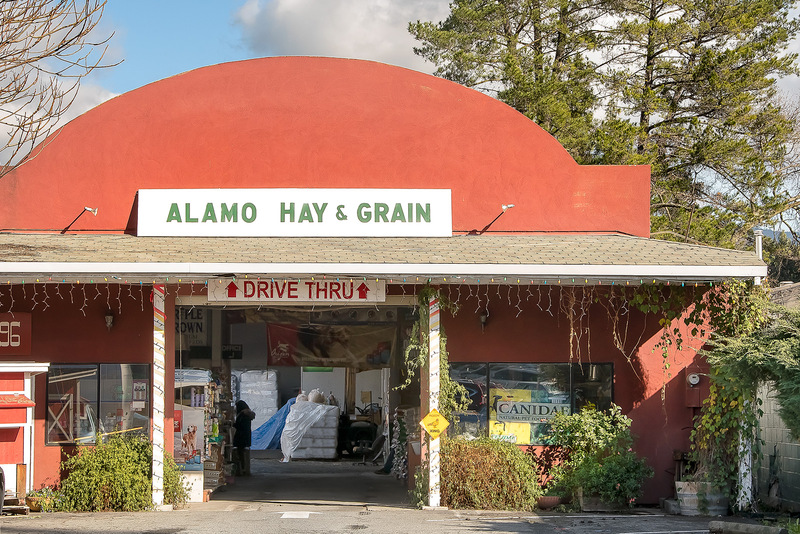 Downtown Alamo is anchored by the Alamo Hay & Grain store, which sports a fiberglass statue of a life-sized Palomino on its roof. 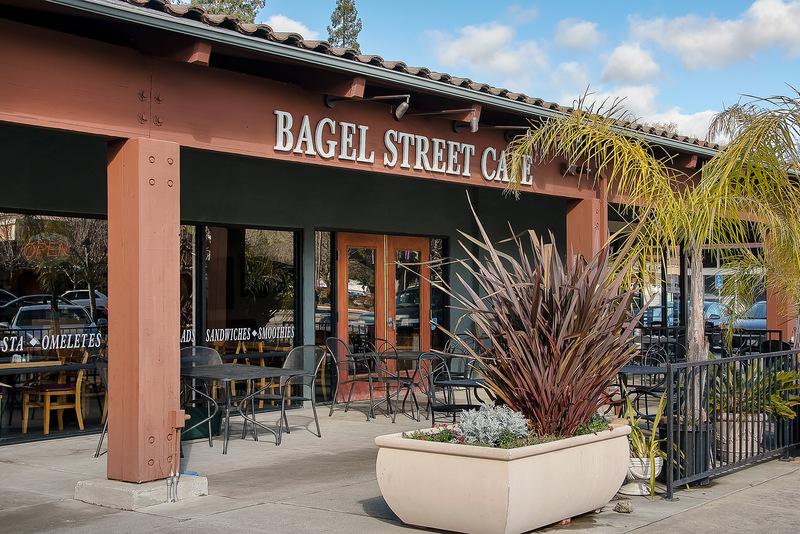 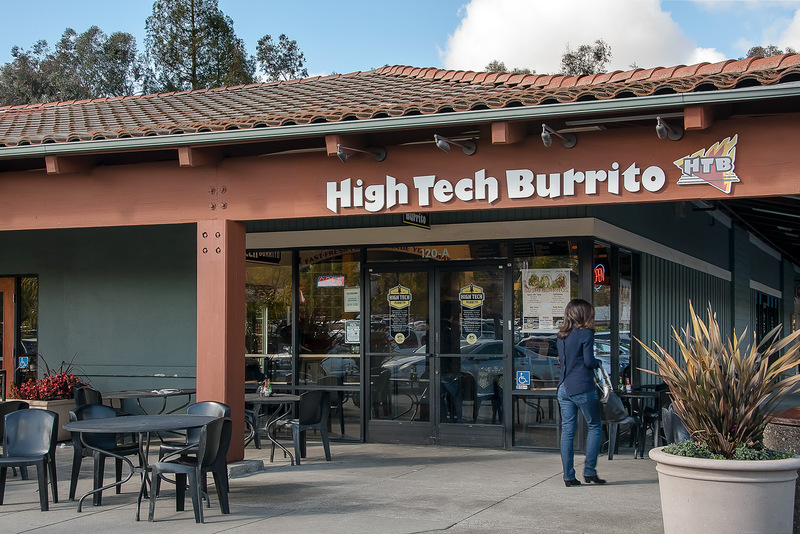 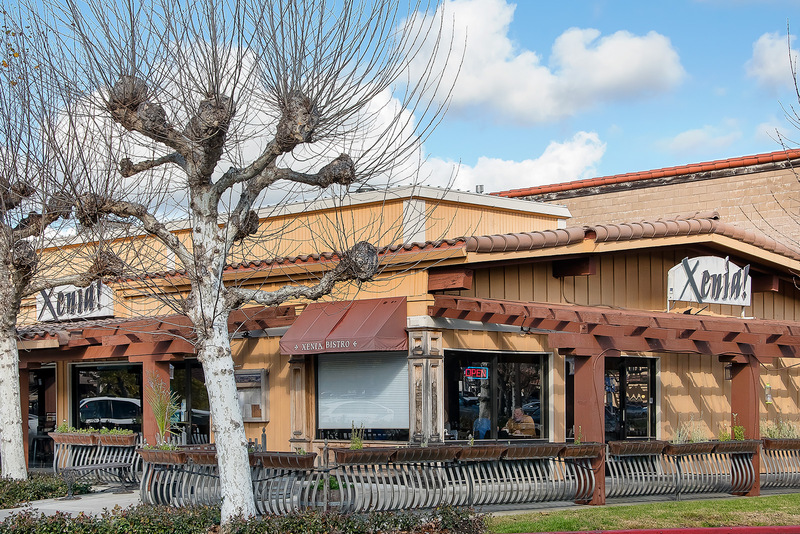 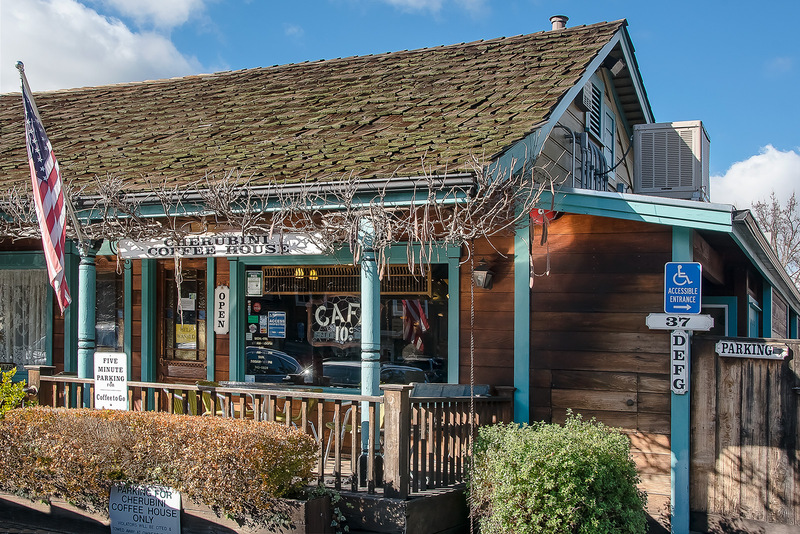 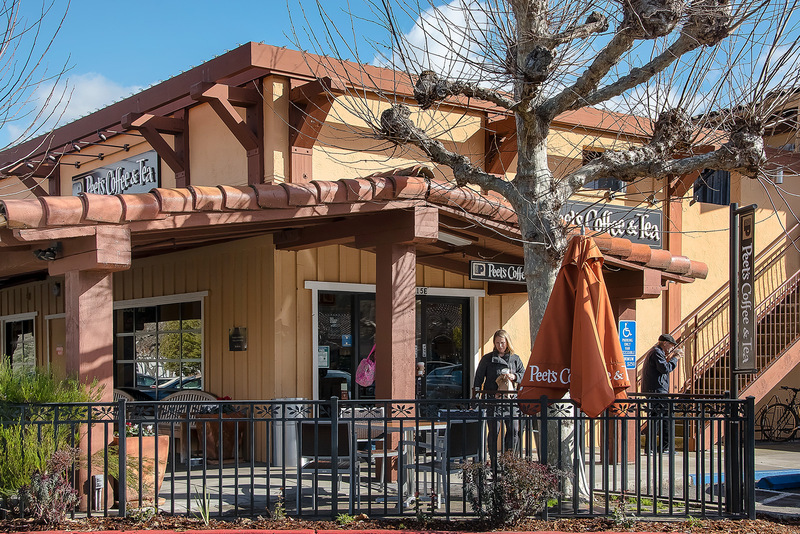 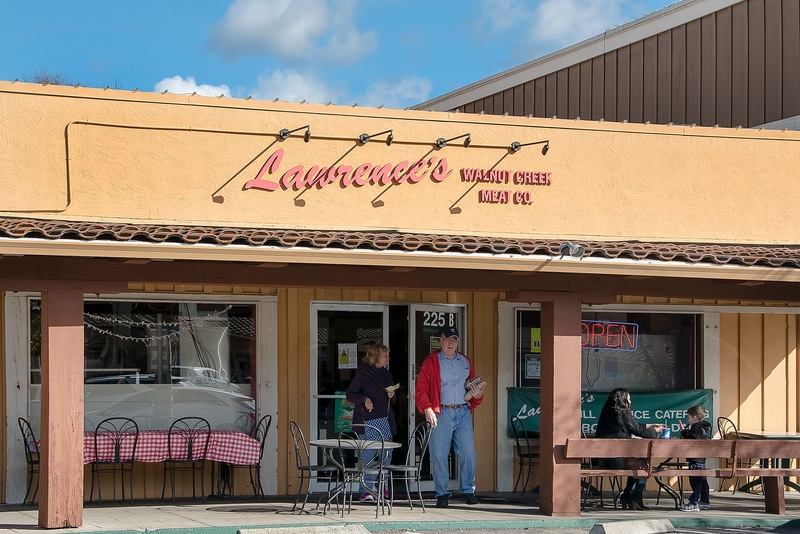 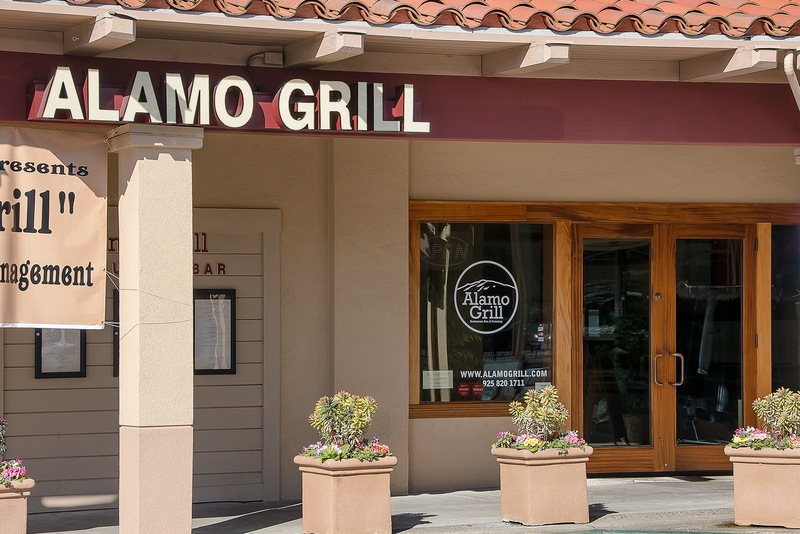 Locals hang out at the Alamo Cafe, Cherubini Coffee House, and Bagel Street Cafe.